This trip was supposed to be a trip to see the Aletsch Glacier, based in Brig, at a warmer time of year. What a disaster that idea turned out to be when I checked the cable car timings the night before we set off and found them to be closed throughout May for maintenance! To add insult to injury the weather hadn’t been too good either and the footpaths from the midway cable cars were all still closed as well; so that was literally the whole trip out of the window. The train related part of the holiday definitely went a lot better than the sightseeing and a good few days were spent around Chur, Luzern & Brig, with some Zurich rush hour bits thrown in. 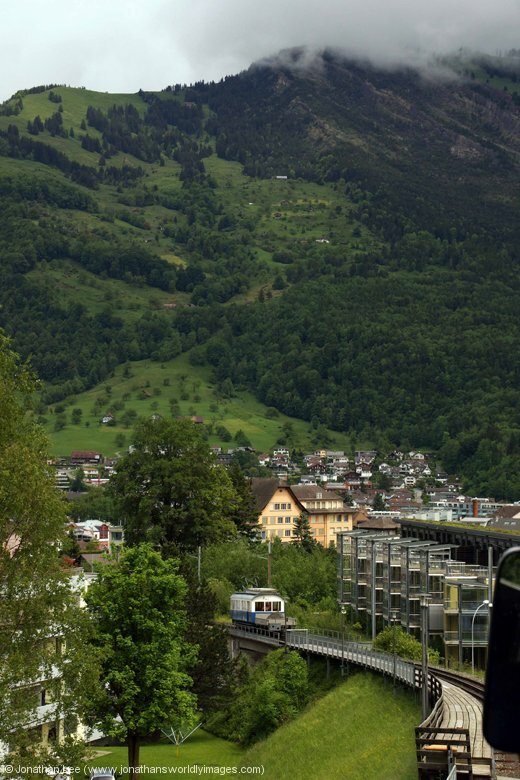 Chur – Hotel Chur (Welschdörfli 2, 7000 Chur, Switzerland) – CHF274 for a single room for 3 nights – My regular hotel when in Chur, only a 7 minute walk up the road from the station if you follow the Arosa line train tracks through the street you won’t miss it on the right. This stay was no different to any other, the single rooms are small and cozy but as I’d asked to move rooms my second room was a little bigger and actually a double room. The rooms have decent sized bathrooms with piping hot water. The free WiFi throughout the hotel worked a treat in my room as well. Breakfast is included in the room rate. Luzern – Erlebnis Jailhotel, Lowengraben 18, Luzern, 6004 – CHF76 for single room for 1 night – My hotel for the night had been booked in walking distance from the station as I was arriving late and departing early. I’d chosen the Erlebnis Jailhotel, through Booking.com, for both its proximity to Luzern station and the cost for a single night. It is literally like staying in jail with basic rooms with a minimal of fuss. The small bathrooms are very functional though and it’s in a quiet location; so long as you’re not in a first floor room and can hear the nightclub below! Brig – Good Night Inn – (£293 for 4 nights) – only a 5 minute walk from Brig Railway Station the hotel seems to cater for large tour groups but their large, clean rooms are more than adequate for the budding independent tourist. Buffet breakfast is included in the room rate and the staff were friendly and helpful. Depending on your room the views of the mountains are great in a morning. My 20th May began while I was on board the 2115 Newcastle – Kings Cross; with 91107 “Skyfall” at the helm. This train arrives into Kings Cross at 0105 and was clearly timed to stagger past the high output ballast cleaning works south of Peterborough. My flight was with Easyjet and at 0710 from Gatwick South Terminal so rather than get a hotel for the night, or basically what little of the night I’d end up spending in it, I opted for the last train to London, where I spent an hour in Starbucks at St Pancras, before doing the 0156 Thameslink service to Gatwick Airport; where I arrived at 0250. For the time of morning there was quite a bit of foot traffic at Gatwick but I walked straight through the ticket barriers, having scanned my pre-printed boarding pass, and as there was no queue at all at security I was sat down airside by just after 0300; my bag and coat being used as a pillow as I attempted a bit of sleep while waiting for the gate to be displayed for my flight to Zurich, which according to the screen would be at 0625! By the time I could be bothered to get my arse into gear there were queues at everywhere doing breakfast so Boots had to suffice. I then stood by the last departure board before the gates waiting for the gate for EZY5113 0710 Gatwick – Zurich to be displayed. I was one of the first to the gate when it was posted and I didn’t bother sitting down; knowing what a free-for-all Easyjet boarding turns into. Sure enough we began boarding a few minutes later but as usual, with most Easyjet flight, we ended up queuing at the bottom of the stairs for 5 minutes before we were allowed onto the plane. Boarding wasn’t too bad but the plane was full and fitting bags into the overhead lockers descended into a fiasco and resulted in people at the front having their bags towards the rear and in the end people at the rear having their bags towards the front. I don’t remember much of the flight as I nodded for most of the journey. We were a little late into Zurich; I didn’t even remember taking off so I had no idea why as we seemed to be boarded in time. It didn’t really matter though as I’d decided on a plan and it involved being on the 1209 Zurich – Locarno, which was booked an Re4/4. 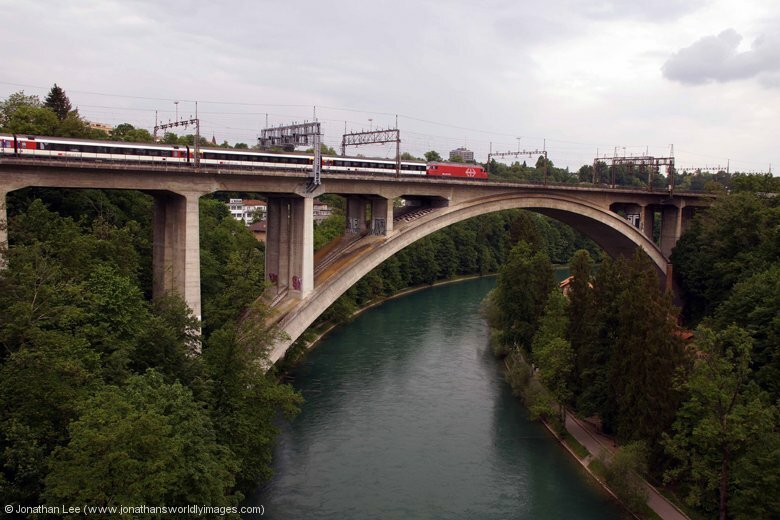 Prior to that though I had no plan and ended up on the first train I could towards Zurich; which was 18239 1036 Zurich Flughafen – Ziegelbrucke with a new 450100. 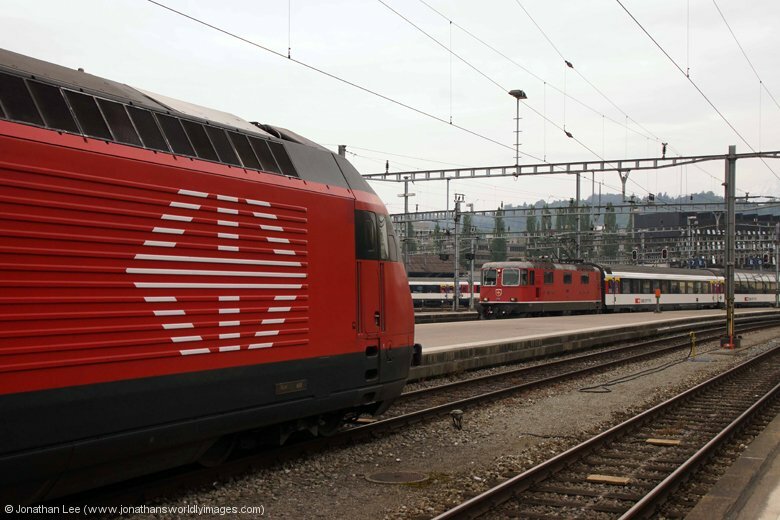 Having got off at Zurich Oerlikon, which was still a building site, I did 460019 into Zurich on IR2641 1047 Zurich Flughafen – Luzern and then went straight back to Oerlikon on an opposing working with 460079 on IR2636 1010 Luzern – Zurich Flughafen. 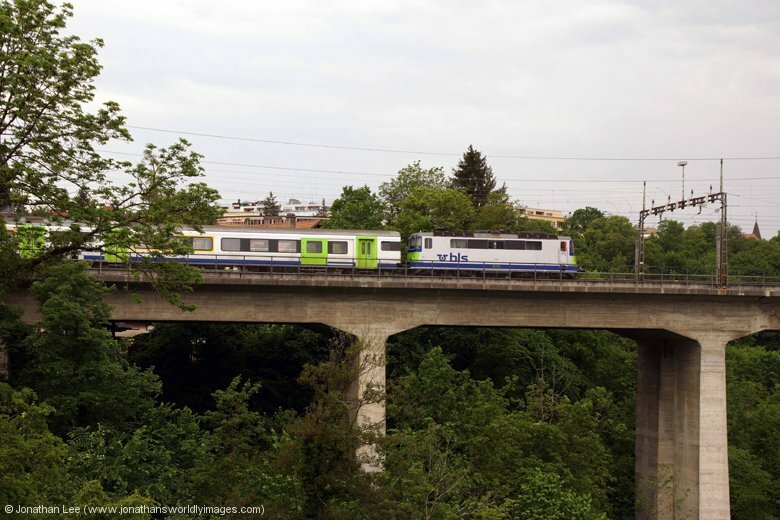 450059 then delivered me back to Zurich Flughafen on 18240 1019 Ziegelbrucke – Zurich Flughafen. 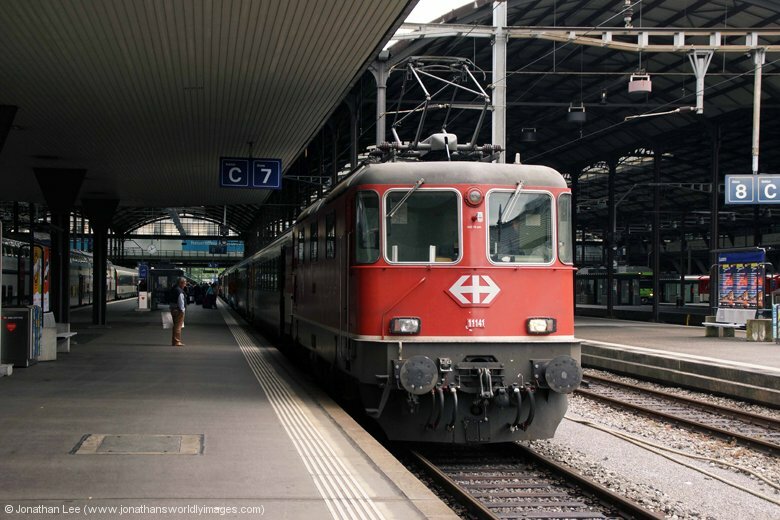 The method in my madness was that I wanted to view EC196 0717 Munich – Zurich Hbf as ever since I dropped on 421375 on one of the SBB turns I always wanted to check out the turns if I was in the area; just in case! 421392 turned up with it though, one of the regular 4 SBB Cargo Re421’s used so I flagged it and did 460062 back into Zurich Hbf instead on IC816 1041 Romanshorn – Brig. Zurich Hbf was quite busy with Re4/4’s when I walked along the blocks, 11111 had just arrived with IC920 1039 Chur – Zurich Hbf and 11114 arrived moments later into the adjacent platform with EN464 2224 (P) Graz Hbf – Zurich Hbf. The later should have arrived at 0920 and as it was almost midday that made it over 2h30m late; I don’t know the reasons why. 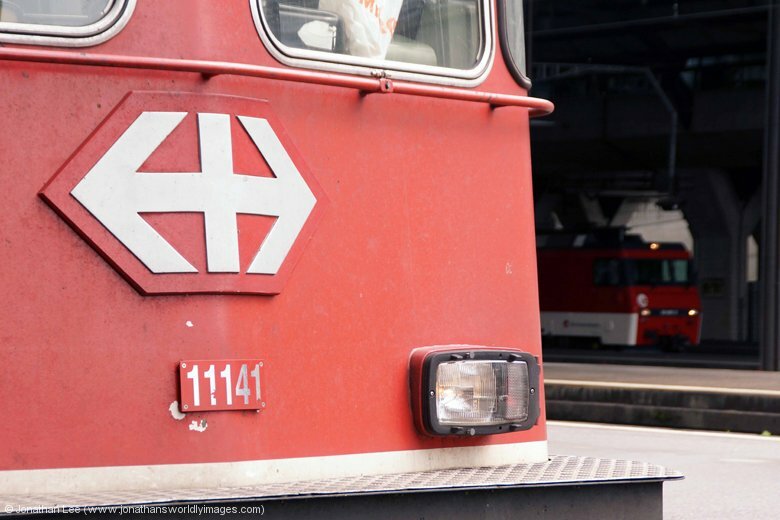 While watching, from the buffer stops, the Re4/4 drop onto the set for IR2421 1209 Zurich Hbf – Locarno I noticed on the big screen that the 1205 Zurich Hbf – Schaffhausen was showing “Ersatzug” and as I peered round onto platform 4 Re4/4 11144 was just coming to a halt on the blocks with a push-pull set; having worked into Zurich with IR2869 1118 Schaffhausen – Zurich Hbf. 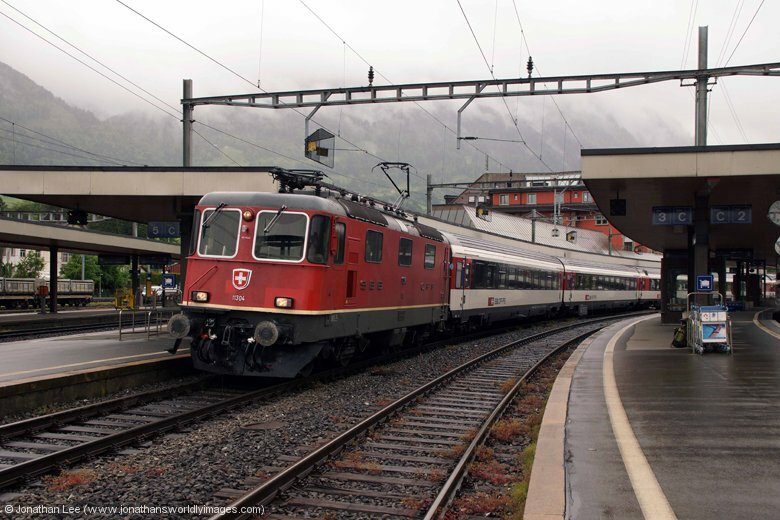 I found 11304 at the front of IR2421 and although I’d toyed with going through to Erstfeld and doing some Erstfeld – Brunnen moves I got off at Arth Goldau to do IR2422 1047 Locarno – Zurich Hbf back in to then head to Basel to do IR2277 1547 Basel – Zurich Hbf back in with its booked pair of Re4/4’s. 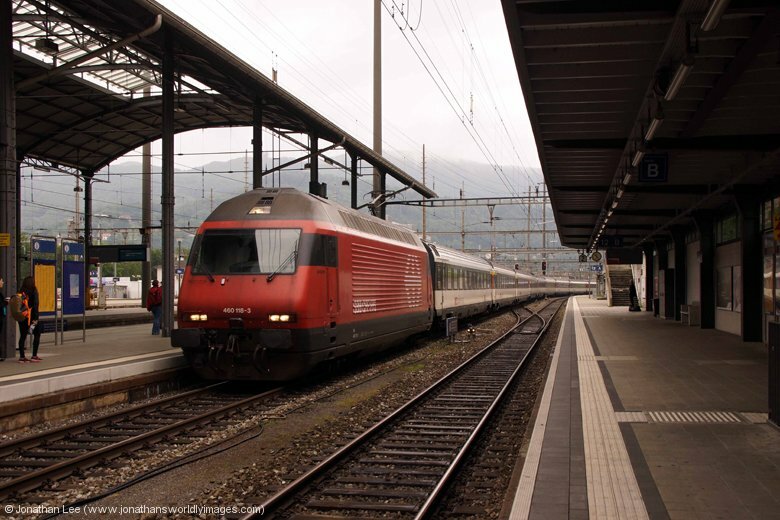 It was still possible to do the pair in on IR2277 off IR2426 1247 Locarno – Zurich, arriving at 1551, by doing the 1608 Zurich – Basel out for the plus 2 at Lenzburg onto IR2277 coming back in but it had been the fact that 11131 & 11152 were both on shed at Zurich that enticed me back; both being winners and 11131 had a driver in it as we left so I hoped it would do IC774 1400 Zurich Hbf – Basel. 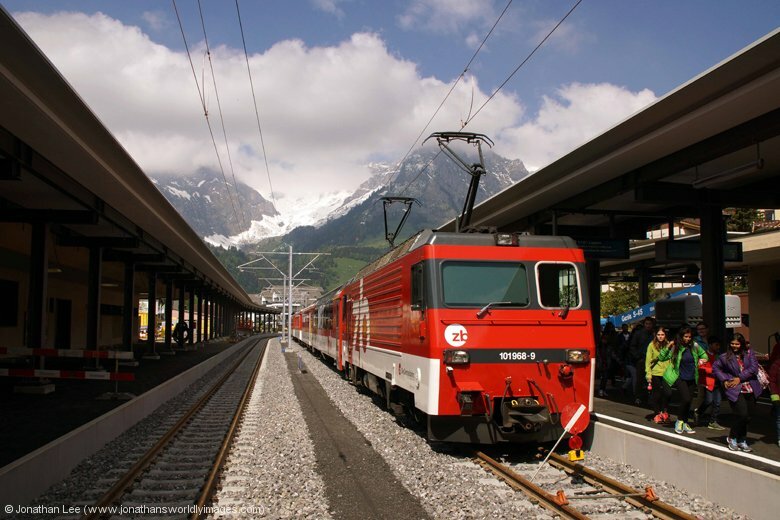 While at Arth Goldau I viewed two Voralpen Expresses, both of which were formed of the EMU cars; VAE2572 1105 St Gallen – Luzern and VAE2577 1240 Luzern – St Gallen. I still had a little interest in the SOB locos as I still needed 446017 but wasn’t going to be wasting a day trying to get it in now there weren’t any SBB Cargo locos on hire. 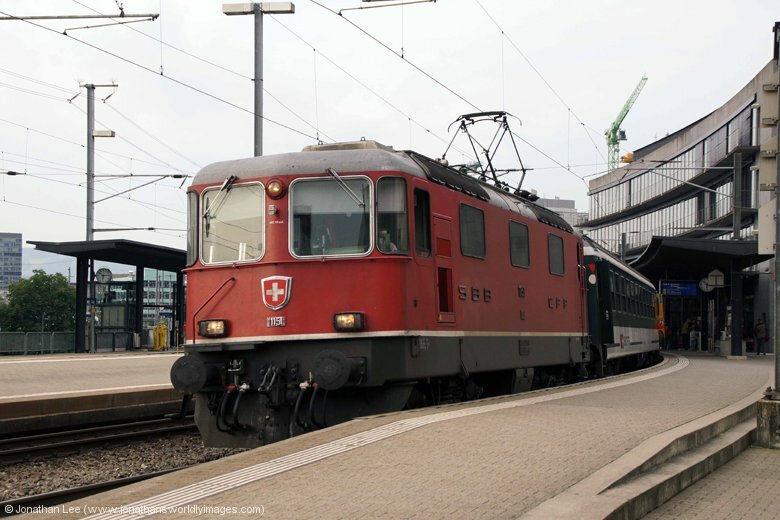 I was quite glad to find Re4/4 11303 roll in with IR2422 as I needed it and it dropped me nicely back into Zurich to watch Re4/4 11152 drop onto IR2274 1408 Zurich Hbf – Basel; which would then make up one of the pair on IR2277 1547 Basel – Zurich Hbf. 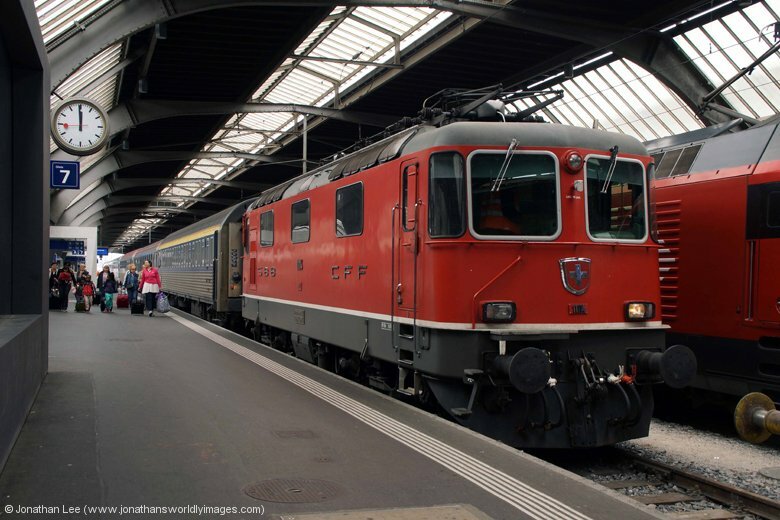 I thought I was in luck as the numbers on the Re4/4 at the head of IC774 1400 Zurich Hbf – Basel started to reveal themselves, especially as it had a diamond pantograph as well; the 1 and 1 were followed by a third 1 and then a 3 but I fell at the last digit when a 0 was revealed and not the 1 I’d hoped for! I still did it to Basel though and spent the fest mostly listening to announcements about trains being cancelled due to a strike in Germany! 11130 left its stock in platform 7 and shortly before 11152 arrived with IR2274 1408 Zurich Hbf – Basel in the adjacent platform 11116 dropped onto the Zurich end of the set. 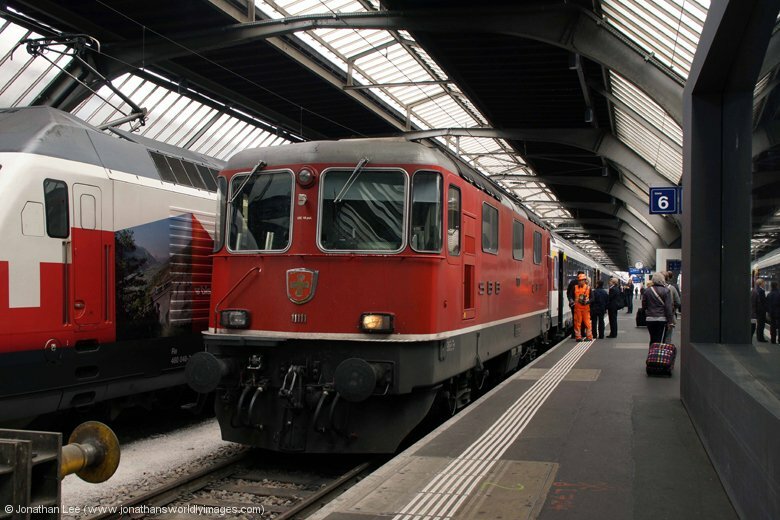 11152 was immediately detached in platform 8 and run round to top 11116 with the set it had arrived with being shunted onto the rear of the set in platform 7, ex IC774 1400 Zurich – Basel. 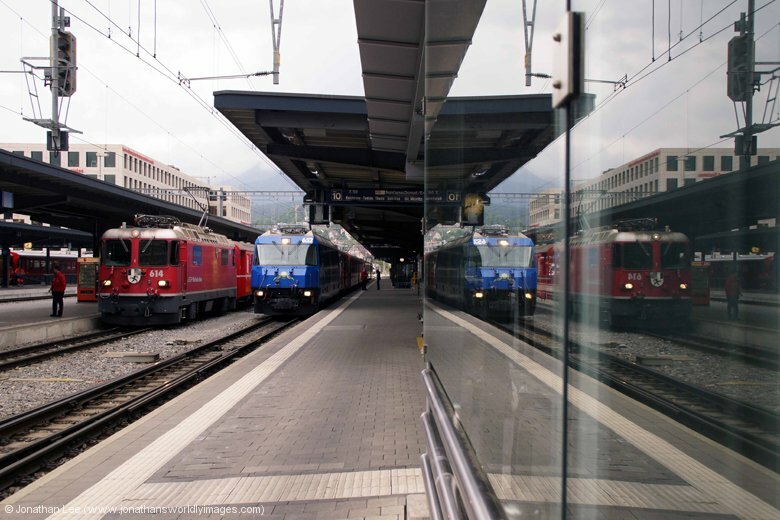 The pair of Re4/4’s were bang on time as they arrived into Lenzburg, where it appeared I’d done the right move after all when 460010 arrived 4 minutes late with IR2278 1608 Zurich Hbf – Basel; just as 11152/11116 were departing! 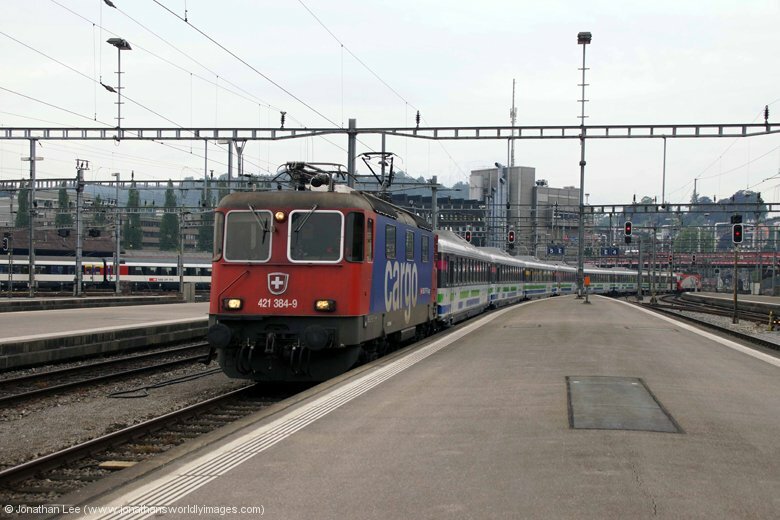 My plan of an evening was going to be to nip downstairs and see what Lion Re420’s were about on the commuters and then do the 1737 Zurich – Chur to Landquart where I hoped Re4/4 11114 would reveal itself on IC936 1839 Chur – Zurich Hbf; having worked down with IC929 1607 Zurich Hbf – Chur if it had stuck to diagram. 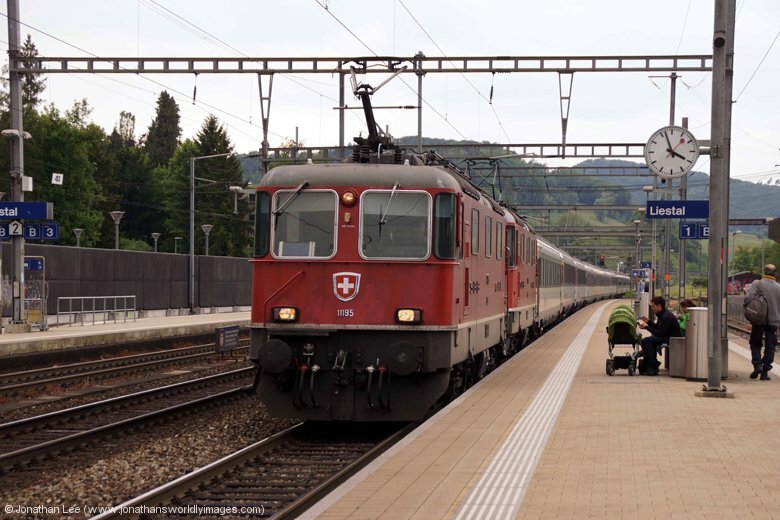 As the pair had arrived a little early I managed to make it down to the lower level platforms just as 420218 T&T with 420217 arrived with 18066 1651 Zurich Oerlikon – Bulach, which I hopped on to Hardbrucke, initially with the idea of doing 19167 1700 Zurich Hardbrucke – Schaffhausen back, but ended up leaping straight back with 450112/450078 in front of it. I did end up on 19167 though as it pulled up alongside the 450’s I’d just got off, with 420207 T&T with 420220; the rear one being a new one so off to Stadelhofen I went. Wary of the time I made sure I was back at Zurich Hbf with enough time to get up to the main platforms for the 1737 Zurich – Chur and was even treated to a new 450 back from Stadelhofen; 450033 on the last possible train I could do with a comfortable amount of time to get upstairs! Food was out of the equation though and I found myself feeling thankful that I’d got a pretzel at Basel. As I got upstairs I noticed “Ersatzug” on the main screen again, this time against IR2129 1615 Biel – Konstanz and went to investigate but as there was nothing in the platform I went to board IC579 1633 Basel – Chur, which had 460094 at the rear. Just as we departed I noticed an Re4/4 and push-pull set roll down platform 4; which was the platform the 1737 departure to Konstanz had been shown on the main screen. Two questions then popped into my head, one being was it 11144 with the same set I’d seen on the 1205 Schaffhausen earlier? The second question was had the Re4/4 actually worked in from Biel? I was a bit annoyed that it hadn’t been in before I’d departed as I would have done it to Konstanz; having never known an Re4/4 go there during my time visiting Switzerland! Still, Landquart bound I was but I couldn’t help but be a little annoyed with the situation! 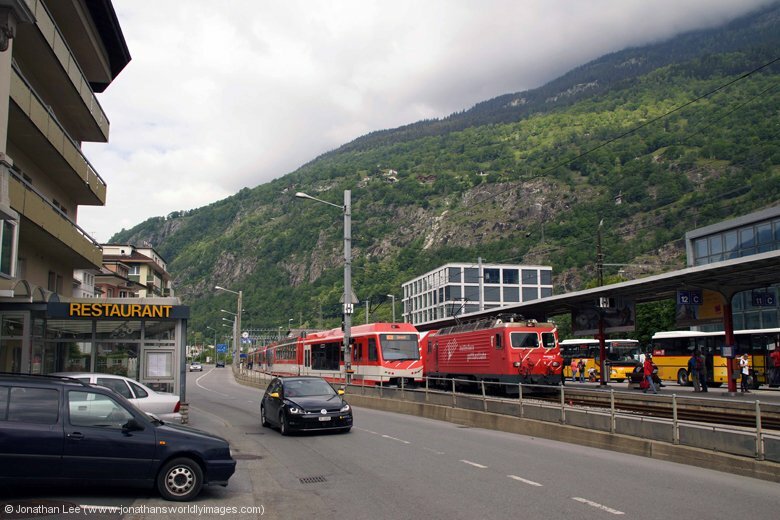 One of my reasons for staying in Chur overnight was to cover the 701 turn, 4221 0753 Ilanz – Chur mixed train, in a morning to hopefully get at least one of the last two 701’s I needed. As I only needed 628 from the passenger fleet I was also hoping it would make an appearance at Chur while I was about; and bugger me if it wasn’t the first RhB engine I saw on arrival into Landquart! Immediate investigation revealed it was only sat waiting to go with the 1849 departure to Scuol-Tarasp; I had the should I, shouldn’t I dilemma and only had 4 minutes to figure out whether I should or not! 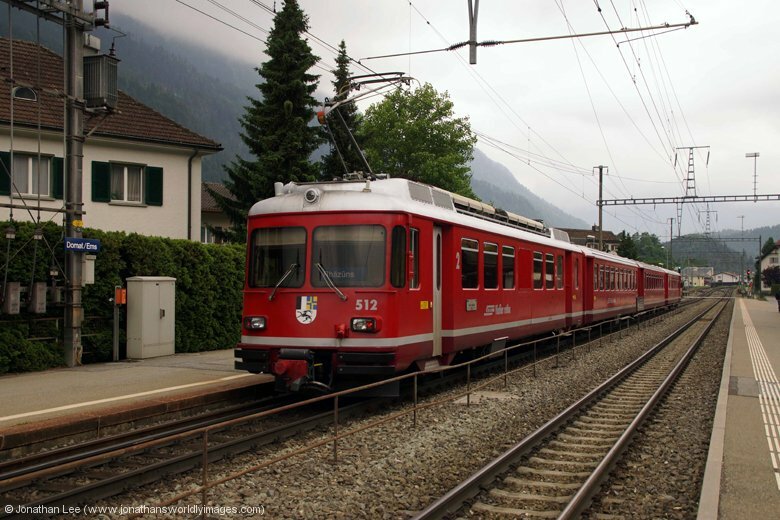 Thankfully my RhB diagrams were to hand and as 628 “shouldn’t” get swapped onto the Pontresina turns overnight at Scuol I decided to stick with my move and cover the 0840 Scuol-Tarasp – Disentis the following morning and hopefully 628 would do as it should. Meanwhile, back in the no flapping world 11114 rolled up as I’d hoped, having stuck to diagram despite being 2h30m late into Zurich with EN464 earlier. 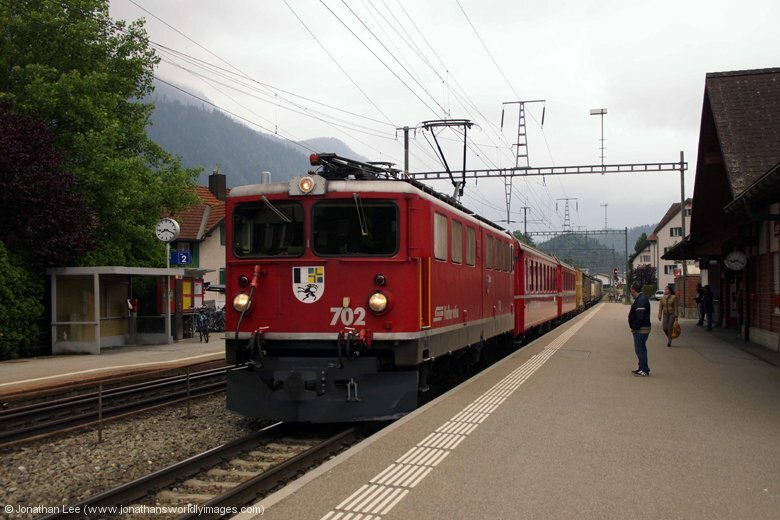 I’d earlier thought about doing it to Sargans and doing the Railjet move, only available on the odd hours from Sargans, to Buchs and return and then calling it a day; as my 20th May had already gone on long enough I called it a day at Sargans and did 460078 into Chur on IC833 1807 Zurich Hbf – Chur and walked straight to the Hotel Chur, which is straight up the main road where the Chur – Arosa train lines run and on the right where the tracks take a left turn; just over the river. Initially I was given a single room at the river side of the hotel, which usually cost more than those on the street side. As it had been raining quite a bit the river was flowing well and making a hell of a racket outside the windows so I went back to reception and asked if there was an alternative room. I was offered a “comfort” room on the 4th floor at extra cost but when I declined that I was given a different room on the same floor at no extra cost; it was a double and in a lot better condition that the previous one I’d had, with nicer furniture too. My stuff was soon moved from one to the other and the original keys handed in. I wasted no time at all in getting the WiFi sorted on my phone so it could do its thing while I was asleep and was straight back out to get something to eat. I attempted the Mandarin restaurant, opposite the hotel but it was closed so I tried the restaurant Verdi Italian but it was full so I ended up in the Zum altern Zollhaus directly above the Verdi and connected to the Mandarin! All are housed in the same building and use the same kitchens and are essentially the business but with each part separated into its own cuisine. I’d never used the Zollhaus before, which served Swiss cuisine, but the sausage and rosti, with onion gravy, was excellent and reasonably priced, the whole meal including beer costing CHF25. By the time I got to bed, at 2130, I’d been on the go for all 21h30m and was more than ready to get my head on a pillow! Needless to say sleep wasn’t hard to come by and I didn’t hear a peep from the roadway outside with my earplugs in. I’d literally slept like a log when the alarm woke me at 0645! Breakfast at the Hotel Chur was brief, as is usually the case when needing to make the 0758 train and breakfast not starting until 0700. The choice isn’t that great but there’s always plenty to go round and enough to make up sarnies and take a bit of stuff for lunch! 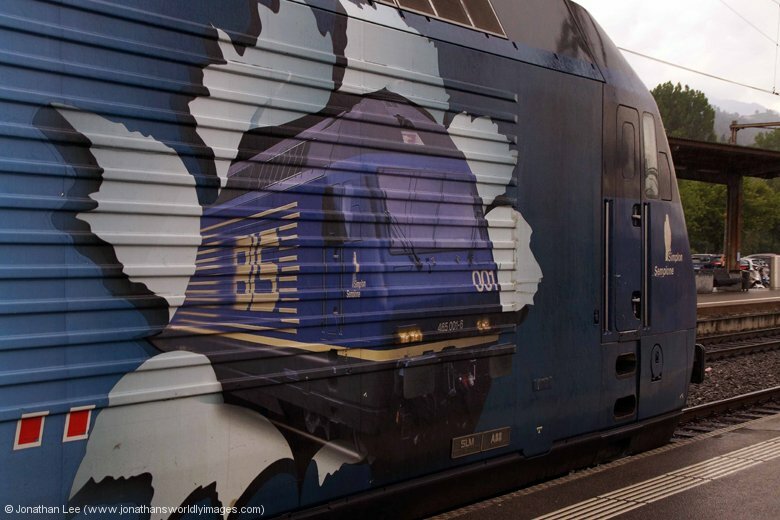 I was at Chur station by 0745 and found RhB Ge4/4 II 625 sat with RE1212 0717 Landquart – Disentis and Ge4/4 III 648, sporting a new livery, a good simple RhB livery for a change, sat with my Re1121 0758 Chur – St Moritz. 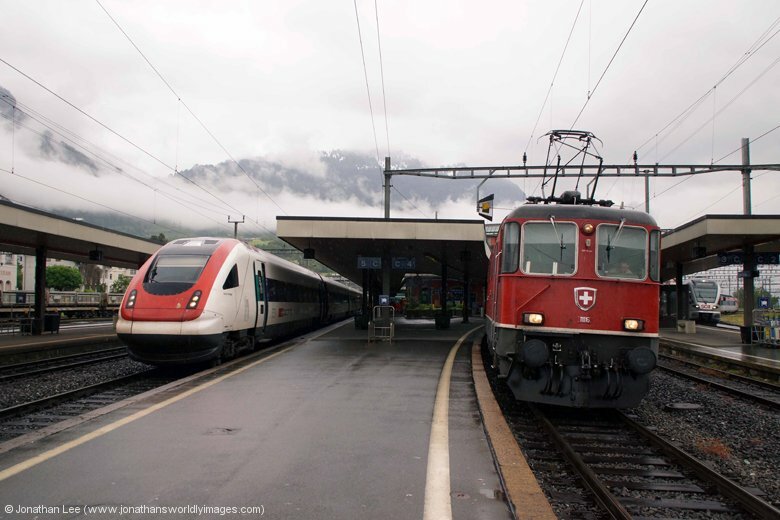 625 departed bang on time and before we departed Ge4/4 III 652 arrived with 1114 0540 St Moritz – Chur and just outside Chur we passed Ge4/4 II 619 with 1223 0644 Disentis – Chur. 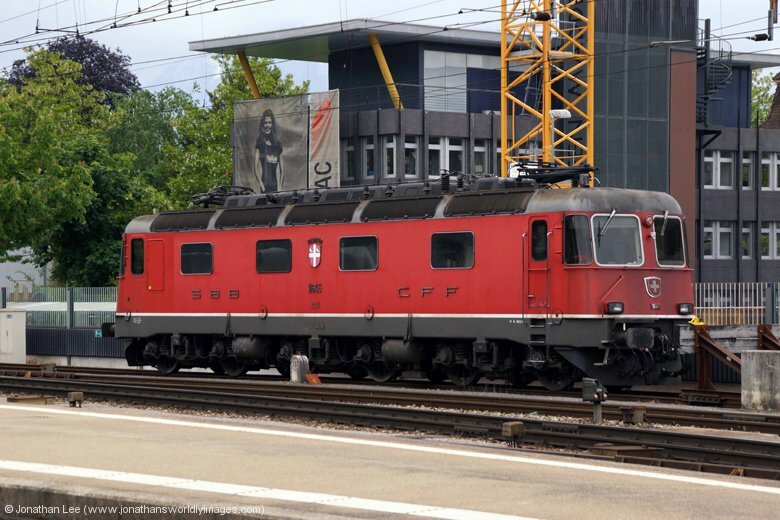 The fester at Domat/Ems for 4221 0753 Ilanz – Chur is only 17 minutes; there is actually a move to do it in from Ilanz but that involves being on the 0658 ex Chur, which I’ve never fancied. It was a normal run of the mill morning and the EMU came and went with the 0815 departure to Rhatzuns, after which I got my camera out in anticipation of 4221 coming round the corner shortly after it had disappeared round it. What I didn’t expect to see approaching from the opposite direction, right behind the EMU, was one of the new RhB infrastructure diesel locos. 28702 was dragging an EMU, which had its pantograph up, and came to a stand in the platform; my initial flap was over in seconds when I noticed nobody on board at all! Once the road came off it disappeared round the corner and away and seconds later Ge6/6 II 703 came round the corner with two coaches and 8 wagons that formed 4221 0753 Ilanz – Chur; the bonus being that it was one of the two I wanted so a good start to the morning it was. 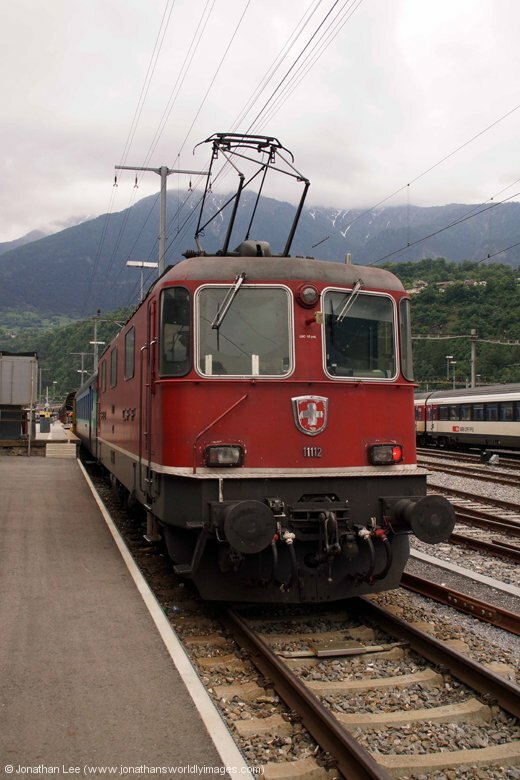 My plan to cover the 0840 Scuol-Tarasp – Disentis, which would hopefully be Ge4/4 II 628, was to do RE1327 0921 Landquart – St Moritz to Schiers for it so in the meantime I could do IC916 0839 Chur – Zurich HB to Sargans for the morning Re4/4 turn back to Landquart for it. 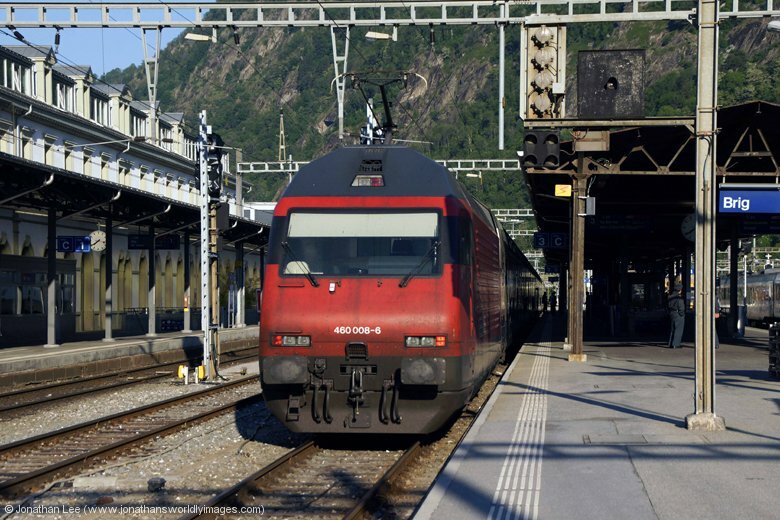 460010 delivered me to Sargans on IC916 and the surprise combination of Re4/4’s 11158/11140 turned up with IC913 0807 Zurich HB – Chur; I’d actually been expecting, or should I say hoping for, 11131, which I had assumed to have done EC186 1305 Zurich HB – Stuttgart to Singen the previous day when it was nowhere to be seen at Zurich in the afternoon. Unfortunately it wasn’t so I did the pair back to Landquart and walked over to the RhB platforms to head out for, hopefully, 628! 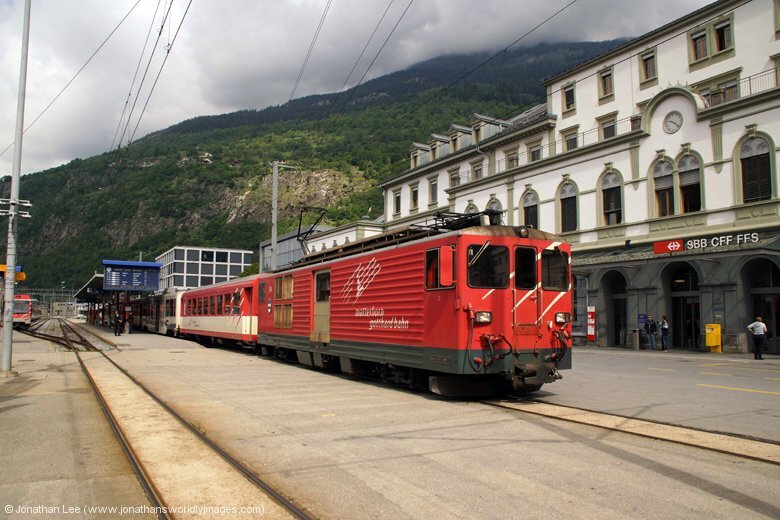 Ge4/4 III 641 was being prepared to work RE1029 0947 Landquart – Davos Platz and Ge4/4 II 616 arrived into platform 8, a couple of minutes before booked departure time, with the stock for RE1327 0921 Landquart – St Moritz; it was a mixed train with 4 coaches and 3 wagons on the rear. As I’d spotted Ge4/4 II 614 with RE1220 0740 Scuol-Tarasp – Disentis I was quite hopeful as I stood in the cold at Schiers and in true SBB fashion Ge4/4 II 628 rocked up a few minutes early with RE1224 0840 Scuol-Tarasp – Disentis; turning the morning into quite a successful one as regards RhB locos, which left me needing only Ge6/6 I 414, Ge6/6 II 707 and Ge4/4 1 603 of the whole RhB electric fleet that remained in service, of course the new infrastructure diesels were a different matter! At Landquart a quick Re460 move was available to Sargans and return, which turned out 460074 for 460116, before I did IC920 1039 Chur – Zurich Hbf to its destination with Re4/4 11140; quite where 11158 had gone, or why it had even gone to Chur in the first place was anyone’s guess. 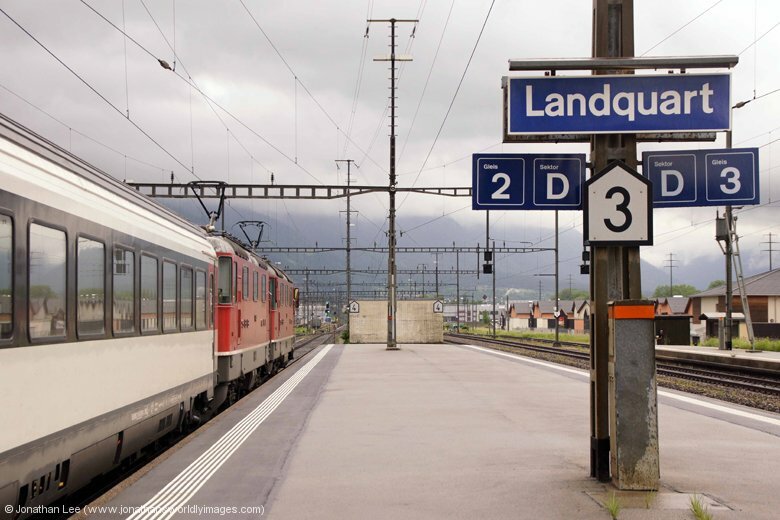 The day’s main plan was to cover the Re4/4 turns on the Locarno based turns on the Gotthard Pass trains, there now being a distinct split in the diagrams on the Gotthard Pass trains with Basel – Luzern and Luzern/Zurich – Locarno being exclusive from each other for the main part. 11116 was just dropping onto IR2421 1209 Zurich Hbf – Locarno when I arrived and 11138 was on the blocks at the opposite end of the stock; having worked in, vice Re460, with IR2418 0847 Locarno – Zurich Hbf. 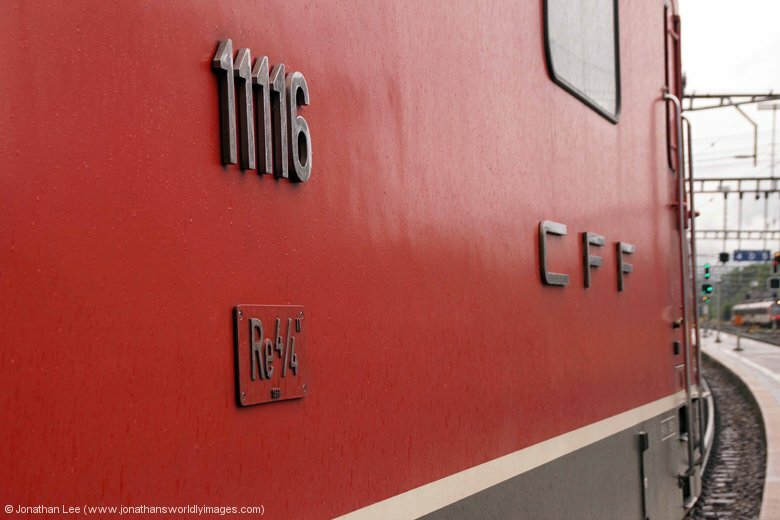 Unlike the previous day there was no mention of “ersatzug” on the main screen but I did check the 1205 Zurich Hbf – Schaffhausen just in case; 460066 was sat waiting to depart with a normal set of push-pull stock. Also waiting to depart while I sat on IR2421 were 460000 with IC921 1207 Zurich Hbf – Chur and 460105 with IC815 0949 Brig – Romanshorn; while SBB Cargo Re421, 421392, arrived with EC196 0717 Munich Hbf – Zurich Hbf and had likely started in Switzerland vice Germany due to the ongoing strike by DB. 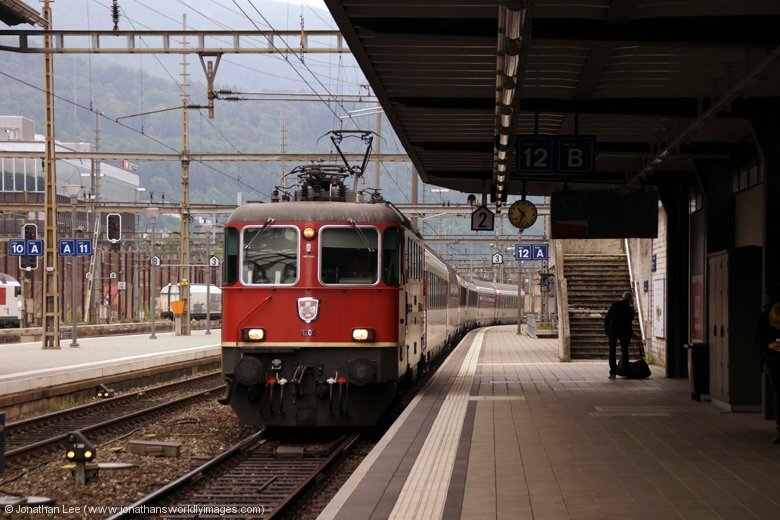 I’d planned to head to Erstfeld on IR2421 but as I made the minus 2 at Schwyz onto IR2422 1047 Locarno – Zurich Hbf I did 11300 back to Arth Goldau instead. This gave me a bit of time to veg about so I walked round to the Arth Rigi Bahn station to gather some bits and pieces for a potential ride after the weekend when my wife would be with me. I’d managed to plan us a trip to Brig to do the Aletsch Glacier when most of the cable cars were shut down for maintenance and snow still blocked the main walking routes so I was looking for any alternative; of course most we nowhere near Brig!!! While I wasn’t particularly looking for 446017 on the Voralpen Express trains I would have done it, had it turned up. 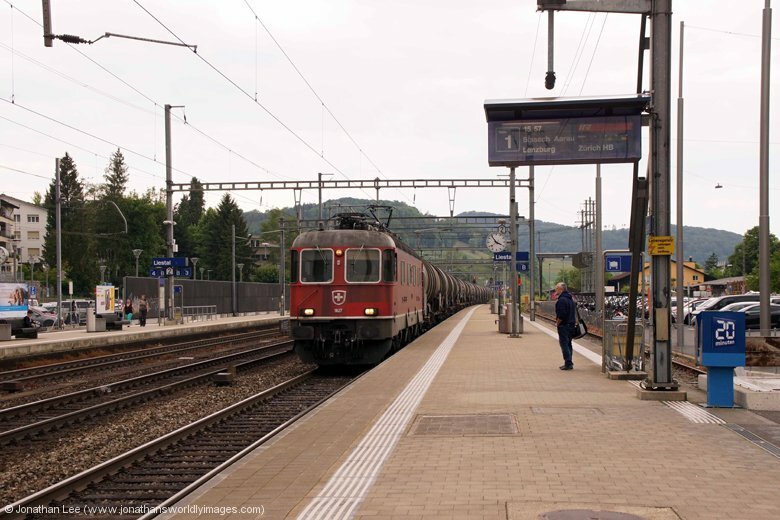 Unfortunately on that front I saw 456091/456094 at Arth Goldau with VAE2577 1240 Luzern – St Gallen and EMU’s 081/084 with VAE2574 1205 St Gallen – Luzern; both the latter and my IR2323 1204 Basel – Locarno were delayed at Arth Goldau to await connections off an incoming ICN, which is a regular occurrence at Arth Goldau, generally of only 5 minutes or so mind. Still it was enough to see me getting off at Fluelen vice risking the plus 11 at Erstfeld. 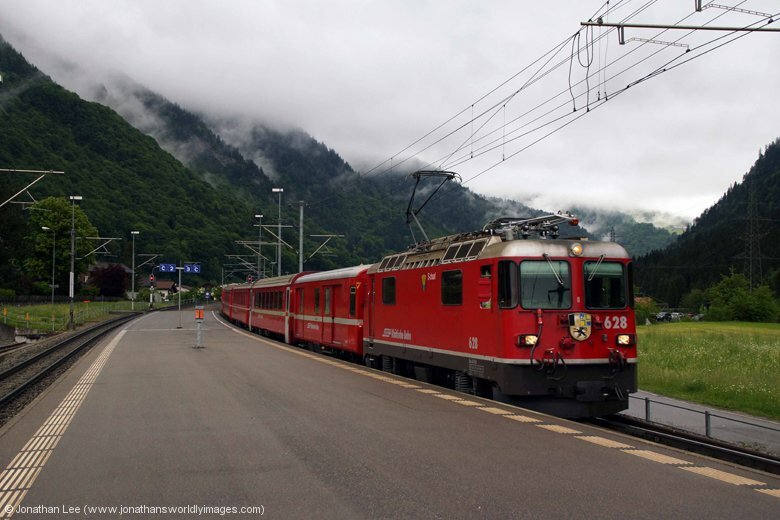 There was a bit more to the idea too as we’d overtaken two freights en-route to Fluelen, both Gotthard Pass bound with combinations of Re4/4 & Re6/6; so there’d be something to pass the time at least, although the weather was dull mind! 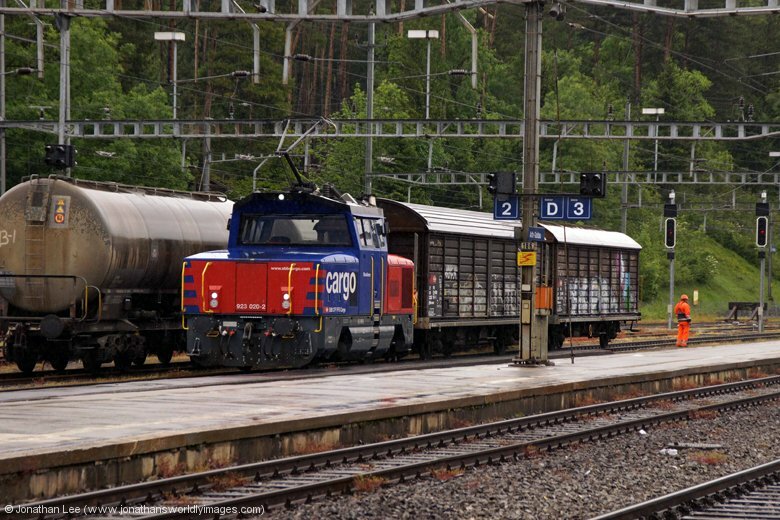 Having watched Re4/4 11155 disappear out of sight with IR2323, during the 25 minutes I had at Fluelen 4 freights passed through, two in either direction, the two Gotthard Pass bound ones were SBB Cargo’s 11322/11636 and 620061/11353 respectively and the two trains coming off the pass were Crossrail’s 185590/185584 and 186109 respectively. Re4/4 11153 arrived right time to take me back to Zurich Hbf with IR2426 1247 Locarno – Zurich Hbf. 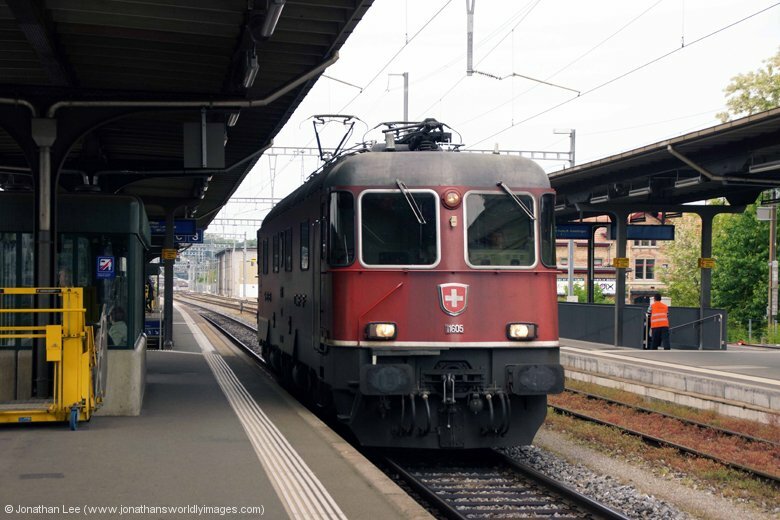 I was a little disappointed to find there were still no trains advertised on the screen as “ersatzug” and having spotted 460066, still working the Schaffhausen turn, with IR2878 1605 Zurich Hbf – Schaffhausen and then walking by 460057 with IC824 1441 Romanshorn – Brig as I headed to the far platforms to do a leap of faith. 460112 headed IR2278 1608 Zurich Hbf – Basel and was thankfully spot on time into Lenzburg, unlike the previous evening when IR2278 had missed IR2277 there. Re4/4’s 11145/11151 could be seen approaching in the distance with IR2277 1547 Basel – Zurich Hbf, as I got off IR2278; and the bonus was that 11151 was a new one. 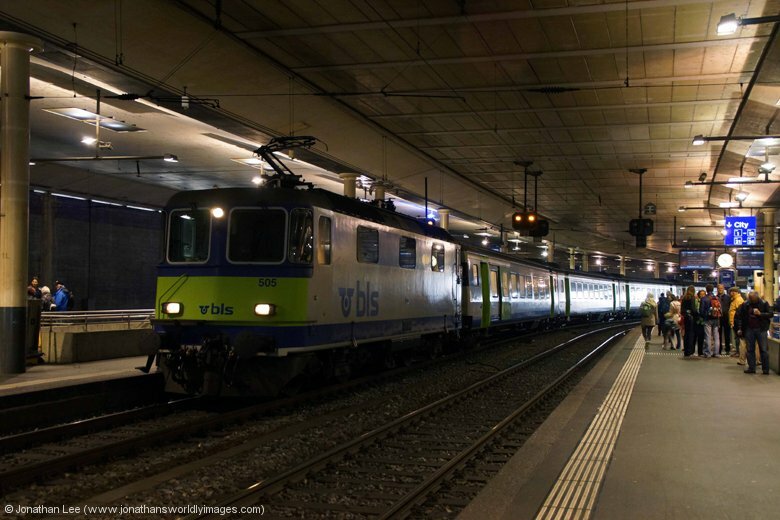 Being on time into Zurich HB gives you 3 minutes to get downstairs to the low level platforms to make 18066 1651 Zurich Oerlikon – Bulach with its T&T Lion Re420’s; I made it comfortably enough and 16 minutes later I was stood at Hardbrucke having done 420201/420221 to Hardbrucke on 18066 for 420223/420230 back to Zurich Hbf with 19167 1700 Hardbrucke – Schaffhausen and then 420209/420216 back to Hardbrucke with 19066 1704 Zurich Stadelhofen – Baden! It was a rush at every hurdle but still worth doing. While stood at Hardbrucke gathering my senses I noticed Re4/4 11135 heading out of town with the same stock I’d arrived on with 11145/11151; it was working IR2280 1708 Zurich HB – Basel vice Re460. 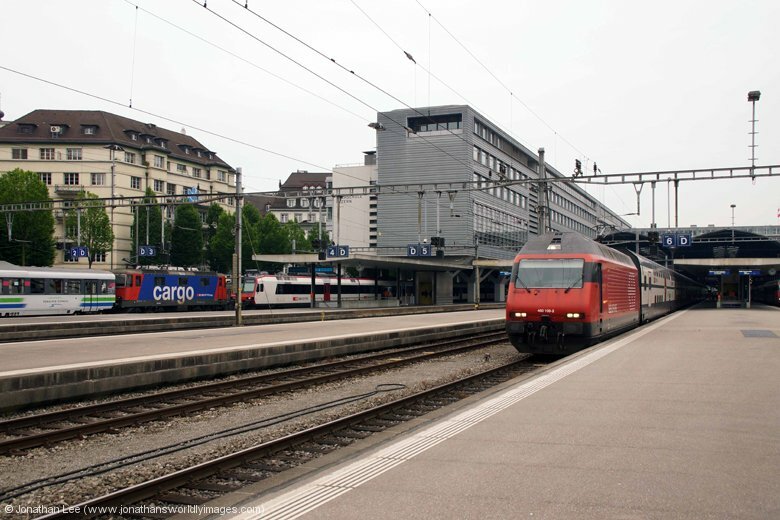 I also noticed 420205/420213 heading into the main line platforms at Zurich Hbf to form 19070 1740 Zurich Hbf – Muri; which was a train I needed to do at some point to get the track in for Re420. I’d made my mind up that I was going to do the 1830 Hardbrucke – Romanshorn to its destination, just to get the track in for Re420, and spent the evening picking up a few Re450’s in the rush while hanging around for it. 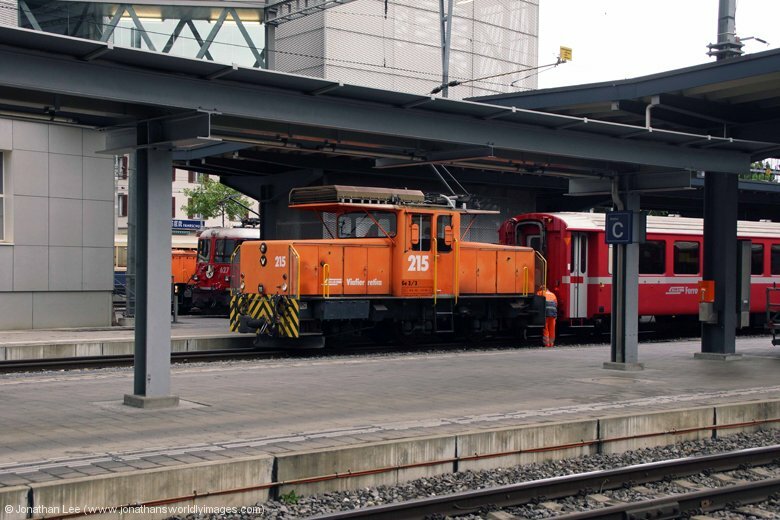 I did nip over to platform 31 to view IR2231 1742 Zurich Hbf – Luzern, the empties for which had been brought in by an Re460, which had Re4/4 11114 at the business end of the train. 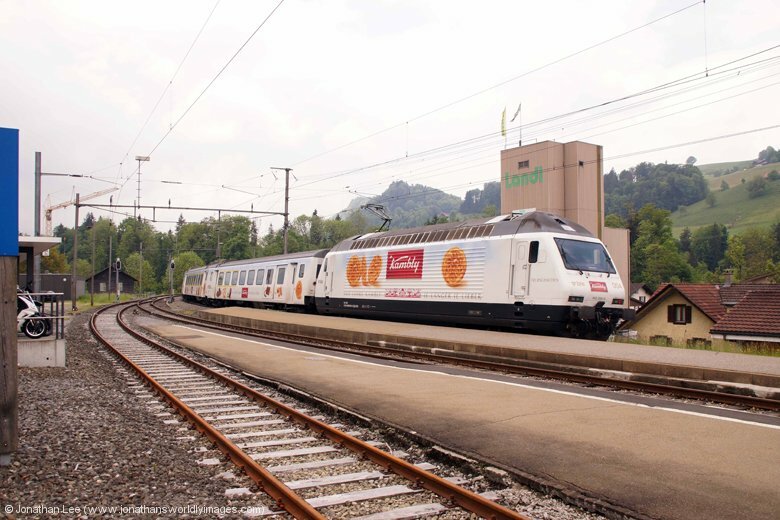 Food for the evening, as I wasn’t going to be back into Chur while late, was from the Migros takeaway downstairs and just as I walked onto the low level platforms to await the 1830 Hardbrucke – Romanshorn arriving in came 450086; which resulted in me boarding the pair of Re420’s at Stadelhofen instead of Zurich Hbf. 420216/420209 did the honours to Romanshorn, the train running quite empty beyond Winterthur; at which I managed to spot 420202/420225 waiting to depart with the last train of their diagram that day, 20380 1906 Winterthur – Schaffhausen. 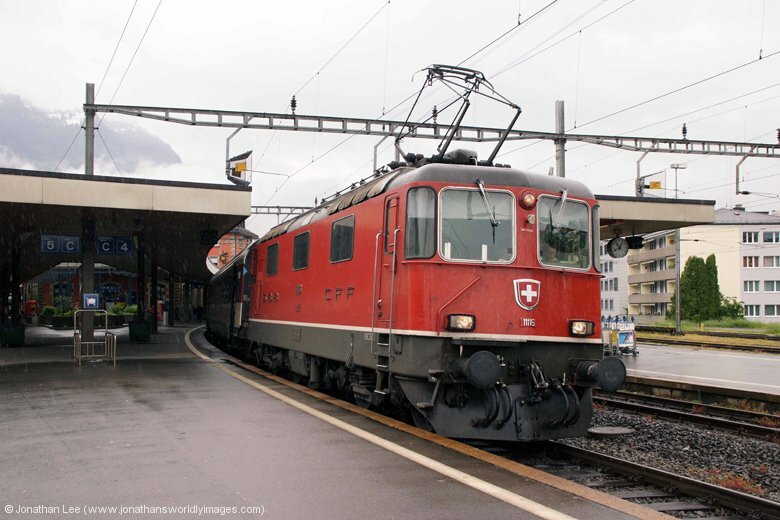 As we approached Romanshorn 460008 departed with IC834 1941 Romanshorn – Brig, which is a dead of the Re420’s. 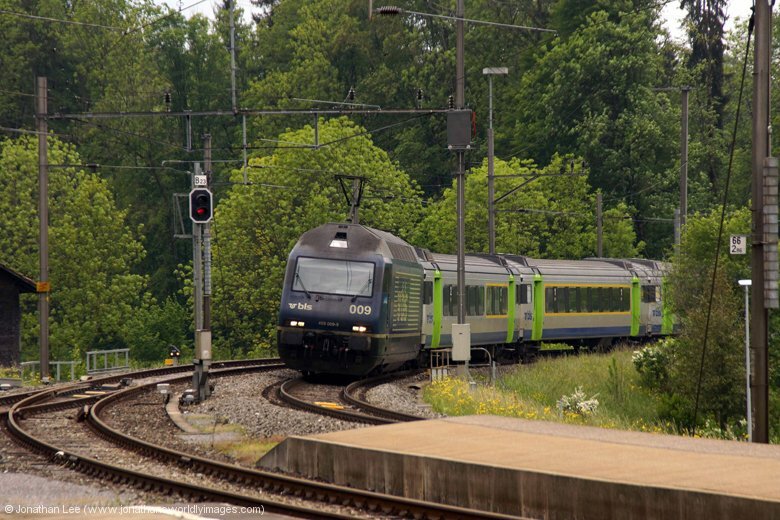 Not that it mattered to me as my route back to Chur was via the scenic route that skirts lake Konstanz and unfortunately it was 18 months too late to do most of it by Re4/4 as the St Gallen – Chur RE trains were now new EMU’s that now ran as Wil – Chur services instead. 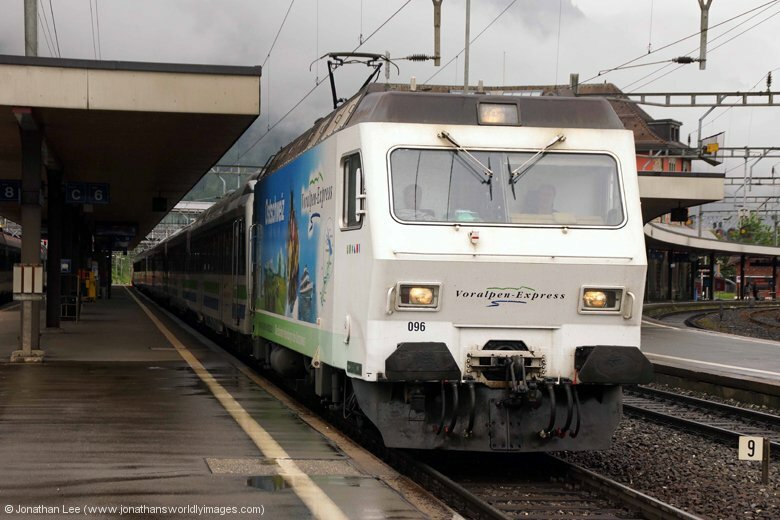 So it was EMU’s all the way to Sargans with a change at Rorschach on the way; it was a harmless enough journey though, the fun coming when I got to Sargans, which should have really resulted in me completing the rest of the journey by EMU! 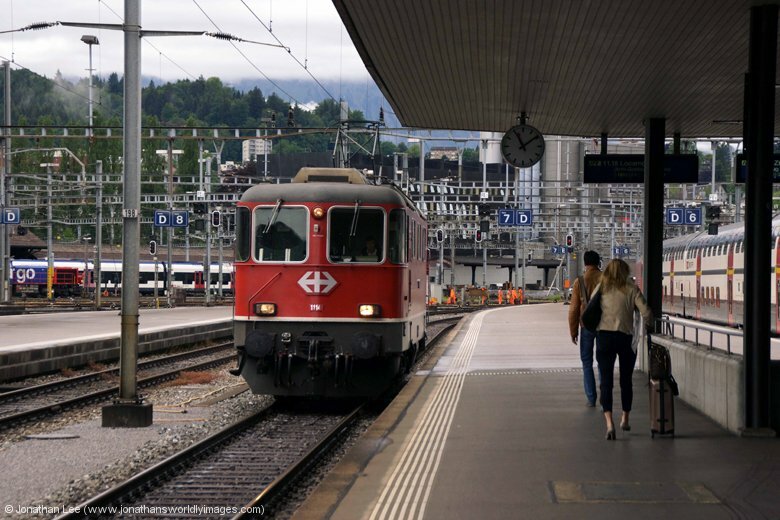 I wasn’t paying much attention as I wondered over from the Buchs platforms to the Zurich platforms at Sargans and noticed a few people legging it by me to attempt to make the 2124 EMU to Chur, which was still stood in the platform. 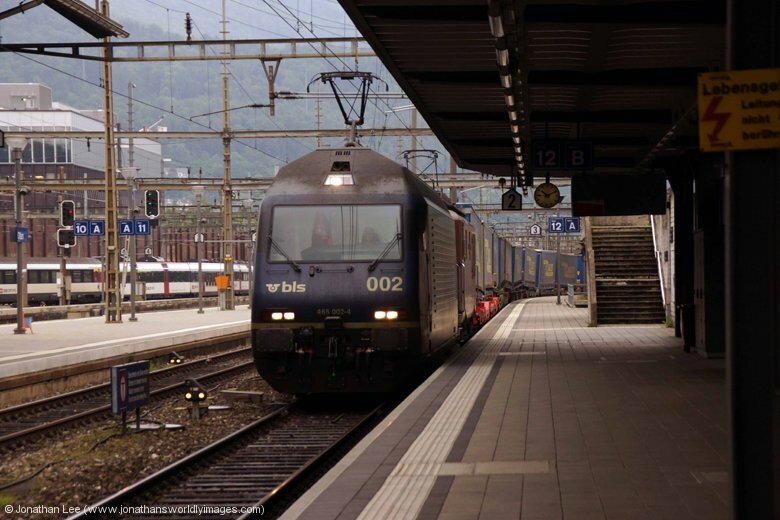 When I casually glanced at the screen I realised why as IC585 2037 Zurich Hbf – Chur was showing 20 minutes late; as was EN465 2040 Zurich Hbf – Graz behind it. An announcement, also announced in English, soon told everyone that both IC585 and EN465 were delayed “due to an accident involving a person”! Quite what that is supposed to mean is anyone’s guess but it can’t have been a fatality as I’m sure the job would have been stopped; surely? Either way I waited the extra 20 minutes and had the pleasure of a new 460086, for my troubles, back to Chur. As it was almost 2230 I had to let myself into the Hotel Chur via the side door. My bag was packed, ready for the off in the morning, rather quickly and I was straight to bed. Having slept like a log again overnight breakfast at the Hotel Chur was even briefer than the previous morning, with having to check out. There was always enough time to have a cuppa and make up some sarnies for later in the day though! 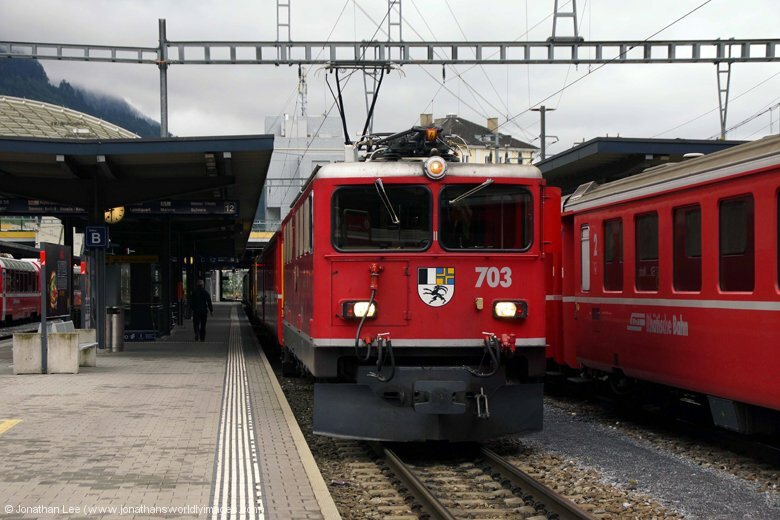 I was at Chur station by 0745 again and found RhB Ge4/4 II 614 sat with RE1212 0717 Landquart – Disentis and blue Ge4/4 III 652 sat with my Re1121 0758 Chur – St Moritz. 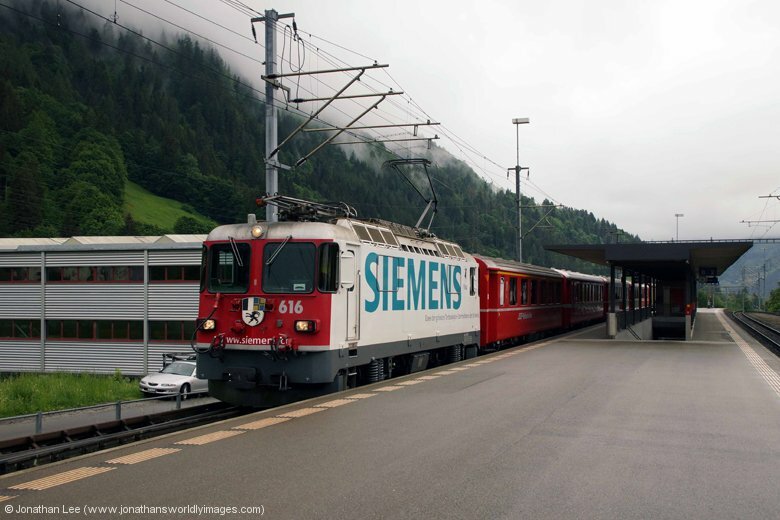 614 departed bang on time and before we departed yellow Ge4/4 III 644 arrived with 1114 0540 St Moritz – Chur and just outside Chur we passed Ge4/4 II 633 with 1223 0644 Disentis – Chur. It was a cooler morning than the previous one but things looked to be clearing up a bit with there being the odd gap in the clouds; I hadn’t seen any blue sky since my plane had descended below the cloud line two days previous! 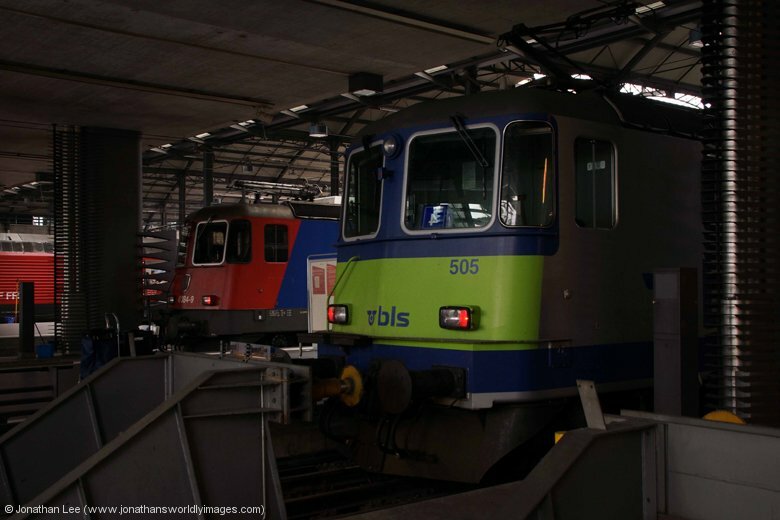 Unlike the previous morning there was no random EMU drag passing through with one of the new RhB infrastructure diesels but 1505 0631 Schiers – Rhatzuns was worked by Be4/4 EMU vice the usual Stadler EMU. Unfortunately my hopes of clearing up the RhB main line fleet were dashed when RhB Ge6/6 II 702, not long back in service itself, arrived with 4221 0753 Ilanz – Chur mixed train; on this occasion formed of two coaches and seven wagons; five of which were split off at Chur before the empty train headed to Landquart. I didn’t actually realise this until I passed it en-route to Landquart from the confines of IC916 0839 Chur – Zurich HB; with 460112 leading. 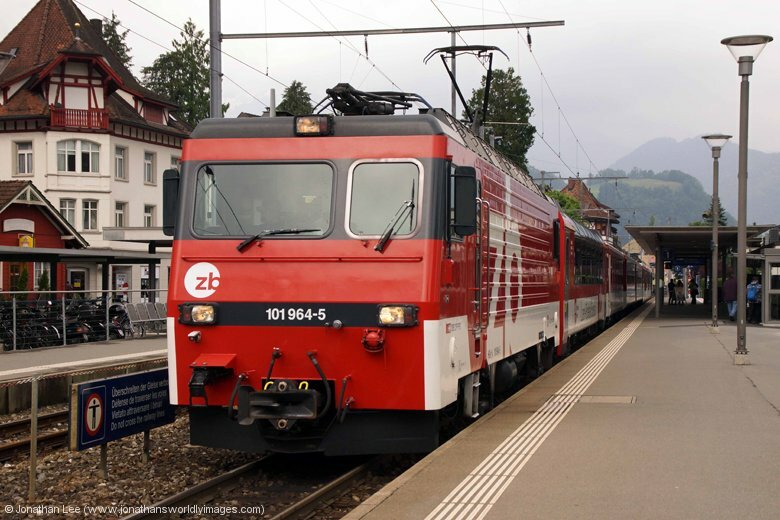 I’d booked to stay in Luzern at the end of the day and decided that heading there as soon as possible was the order of the day as there was nothing left to do in Chur and I’d already covered quite a lot of the Re4/4 turns on the Gotthard Pass so thought I’d take a look at the BLS turns on the Luzern – Bern circuit and the ZB 101 turns on the Engelberg line; and anything else that might turn up in the meantime, with the ultimate goal for the day being to cover 17078 1646 Basel – Delemont to get the track in for Re4/4. The latter move working nicely off IR2324 1147 Locarno – Basel, which should be an Re4/4 that I hadn’t come across already if the diagrams held out. 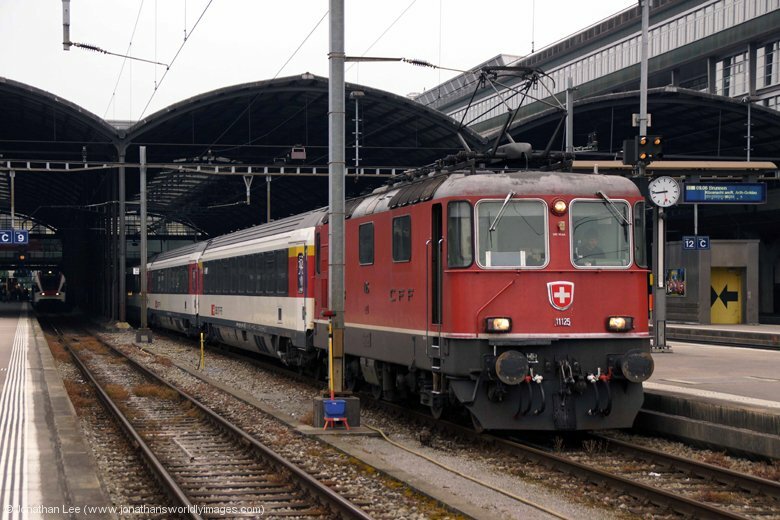 I made the plus few onto IR2364 0957 Zurich Hbf – Bern, at Zurich, and it seemed sensible to do it as it was a new 460073 but I was left hoping, all the way to Olten, that it would make the plus 2 onto IR2319 1004 Basel – Locarno; it made with ease in the end and Re4/4 11153 dropped me into Luzern where I watched Re4/4 11116 drop onto the other end to work forward to Locarno; from the confines of ZB’s IR2968 1110 Luzern – Engelberg Express, which would be terminating at Wolfenschiessen due to planed engineering works that had been on since late April and thankfully finished at the end of the day with the Engelberg service returning to normal on Saturday 23rd May. 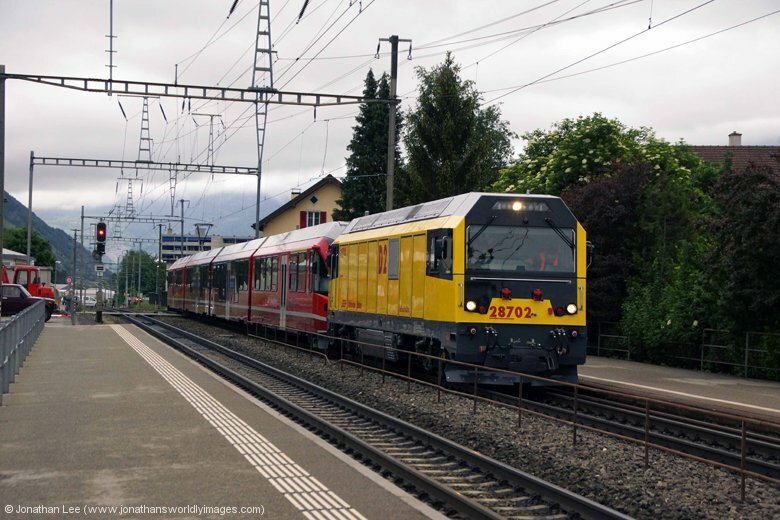 When I’d figured out that the Engelberg service was terminating short I’d half expected to find EMU’s covering the Express turns but 101964 took me out to Stans on IR2968 and 101961 returned me to Luzern 11 minutes later on IR2969 1122 Wolfenschiessen – Luzern; which ran into platform 15 and was taken out of service. Sat in platform 13 waiting to work IR2970 1210 Luzern – Wolfenschiessen was 101968, which I needed but opted to get it in after I’d done a move out and back on the BLS Luzern – Bern trains as 465004 was sat waiting to depart with 4370 1157 Luzern – Bern. As 465004 departed we passed 465006 heading into Luzern with 4367 1037 Bern – Luzern, which was one of the only two BLS Re465’s I’d had so it made the move simple really, instead of the double back to cover all four turns, in that I only needed to do an out an back and would view the fourth turn later to see it was new or not. As the BLS turns comfortably make at Entlebuch there was no cross platform leaping, hoping the doors stayed open on the other set and it’s a decent photo of the trains departing and arriving there on the curve. I was quite pleased to see 465009 arrive with 4369 137 Bern – Luzern, which is effectively a BLS Cargo loco, as I’d flagged it at Luzern last time I’d been in the country and hadn’t realised that the BLS fleet was effectively sectored up with anything above 465006 being generally Cargo only. Lesson learned and error corrected 465009 put me back into Luzern to find Re4/4 11125 just dropping onto IR2323 1204 Basel – Locarno, with Re4/4 11146 sat on the blocks having worked it into Luzern. 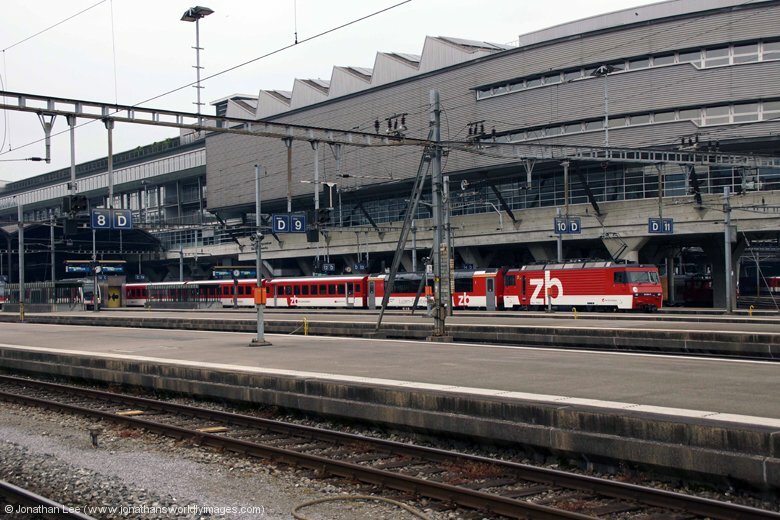 To my surprise it seemed to be all change on the ZB Engelberg Expresses as 101967 was sat in platform 13 waiting to depart with IR2972 1310 Luzern – Wolfenschiessen and 101964 was sat in the yard where it had been earlier; parked next to De110, 110021, which seemed to be attached to some coaches but unfortunately had its pantograph down and didn’t appear to look like it was going anywhere soon. So 101967 out to Stans for 101968 back it was, the latter with IR2973 1322 Wolfenschiessen – Luzern. En-route back 101961 and its whole set were on the shed, having likely followed 101967 up. Also on shed was 101965, not attached to a set, which left 101962, 101963 and 101966 unaccounted for. 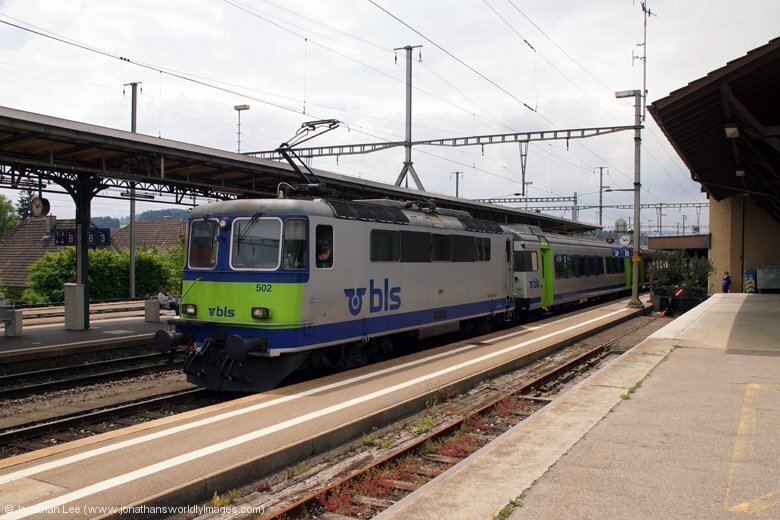 At Luzern my move was thrown into chaos when I found SOB’s 446017, my last SOB engine, on the blocks to work VAE2581 1440 Luzern – St Gallen; 446015 was leading the set. 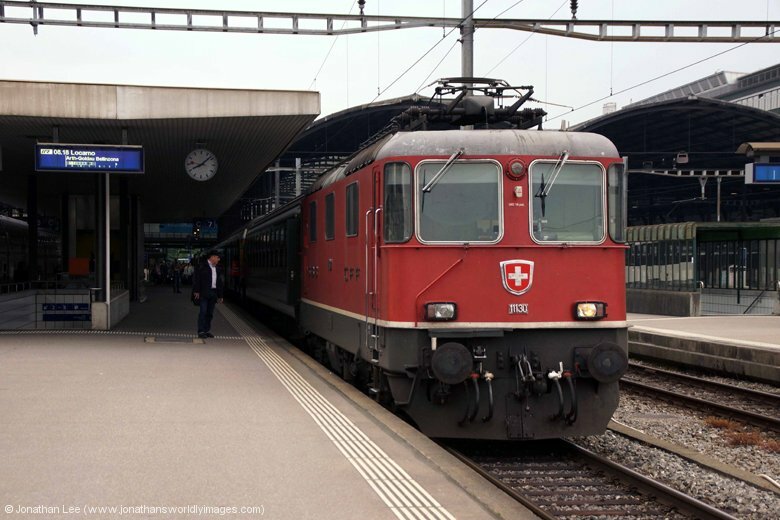 If I did it I couldn’t get for the Delemont commuter at Basel so it was decision time and in the end I opted to do it on the return and hatched a plan to head to Zurich and end up on IR2433 1809 Zurich Hbf – Chiasso to Arth Goldau for 446017/446015 back into Luzern. This would be my last chance at having it as well as according to the diagrams it should sit spare at St Gallen all day Saturday! 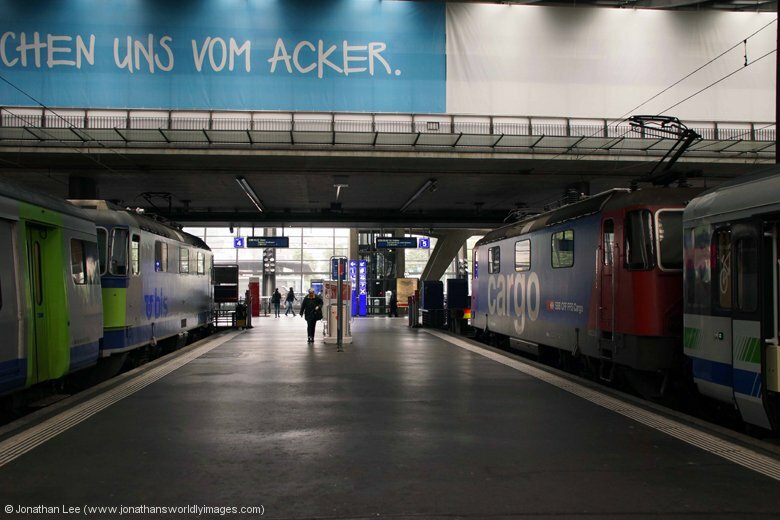 While not a conventional way to get to Zurich Hbf it turned into an entertaining one nonetheless! 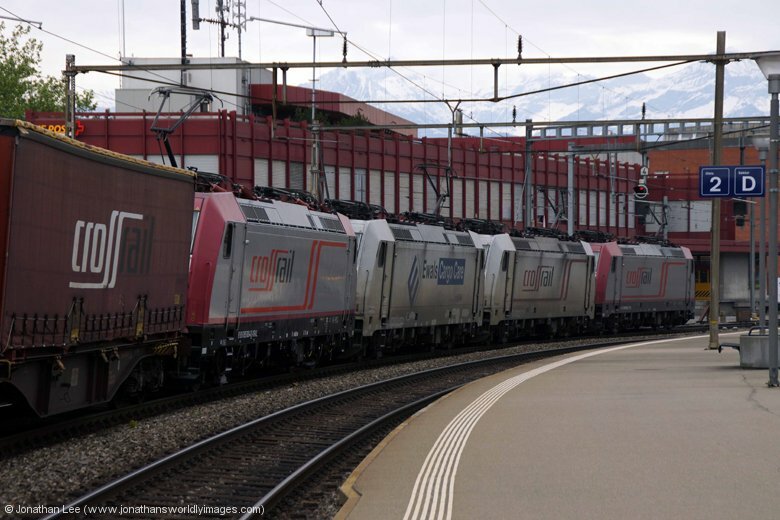 The idea being to cover IR2277 1547 Basel – Zurich Hbf in the process with its pair of Re4/4’s and all was going swimmingly, having done 460001 to Olten on IR2464 1430 Luzern – Basel for 460116 to Liestal on IC974 1400 Interlaken Ost – Basel, when Re4/4’s 11195/11153 arrived with IR2277; hot on the heels of Re6/6 11627 running through the platform with a freight. 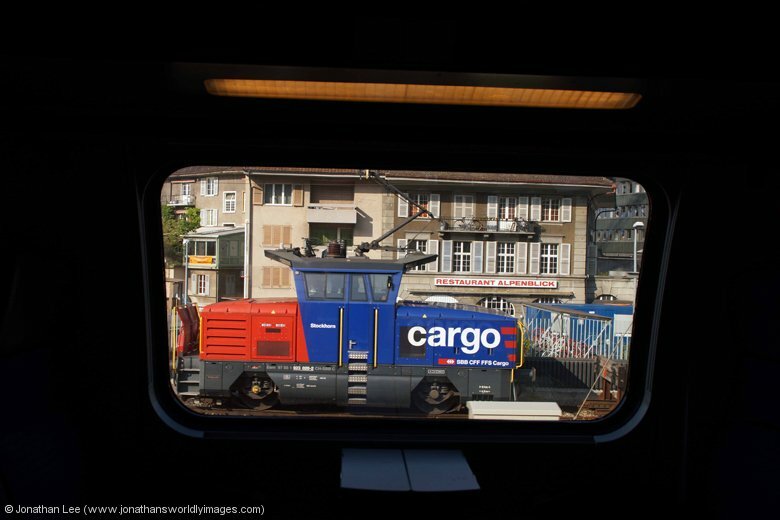 It wasn’t until we came to a halt at the station before Aarau that things started to take a turn for the worst. The guard first announced we would be sitting there for a few minutes due to a technical problem with the train and then a few minutes later announced that we’d be on the move in 4 to 5 minutes; we’d actually set off before he’d finished his announcement, amidst a load of laughs from within the coach as he was still announcing! Thankfully he’d announced in English so I could understand what was going on but despite our stop we were only 7 minutes late into Aarau, which wouldn’t cause too much bother to my Zurich rush hour moves, although I’d not be doing the pair for a pair for a pair move with the Lion Re420’s as a right time arrival was needed to make 18066 1651 Zurich Oerlikon – Bulach. All seemed well as the guard blew his whistle and closed the doors for departure, the fact that we didn’t depart was cause for concern. 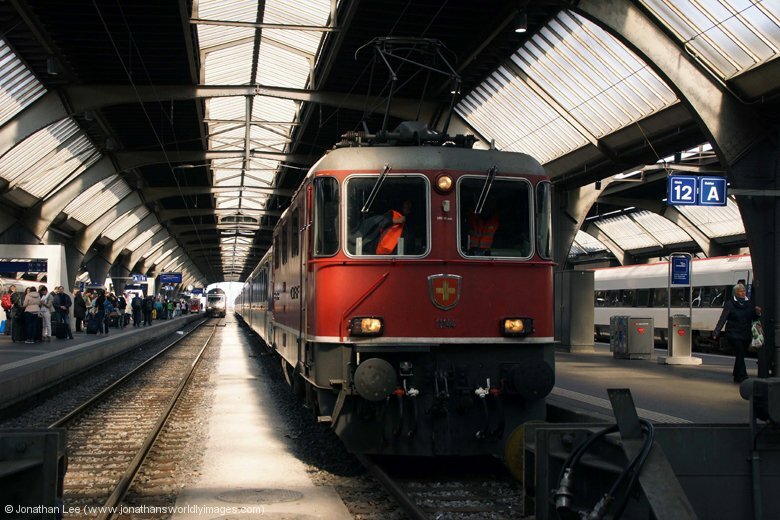 Sure enough an announcement soon followed that there we technical problems again and passengers for Zurich Hbf only should transfer to the ICN that had been stopped in the adjacent platform, passengers for Lenzburg were told to remain seated at that point. It soon degenerated into a farce and when I got out to see what was going on I found the pantographs down on both locos. 10 minutes later the train was cancelled and everyone thrown off. 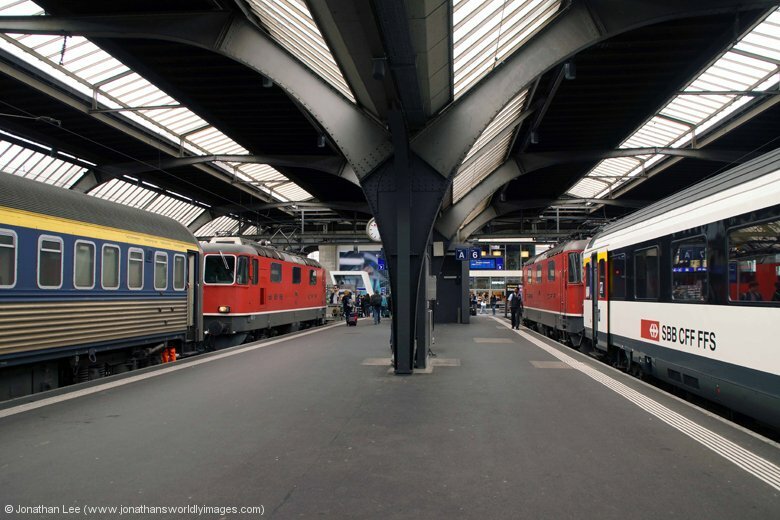 There was a rush hour 1653 Aarau – Zurich Hbf in the opposite platform, formed of two Re450’s, which called at Lenzburg and Zurich Hbf only and people were directed to that. Meanwhile a new Re460012 sat in the platform with IC825 1449 Brig – Romanshorn but the doors weren’t released; yet strangely IC1429 1611 Bern – Zurich Hbf behind it was stopped additionally to pick up people for Zurich Hbf, despite everyone having been directed to the 1653 departure with the par f Re450’s. Both trains actually departed Aarau simultaneously with 460091 and IC1429 winning the battle and getting routed onto the main line first. While it was a farce and 11195/11153 were left behind at Aarau I only arrived into Zurich Hbf 20 minutes later than I should have; where I was left wondering what SBB would do for IR2433 1809 Zurich Hbf – Chiasso as 11153 should work it by diagram. 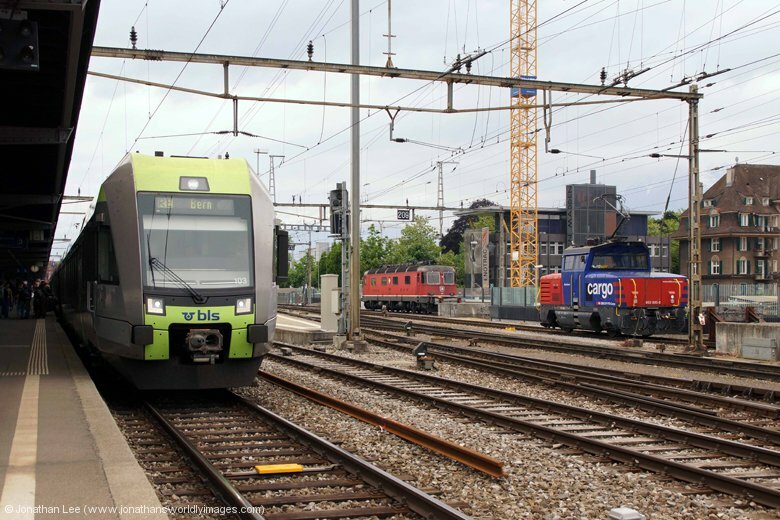 There was also no stock for the 1708 Zurich Hbf – Basel so I wondered if the pair would be run round at Aarau and work that back, starting there? 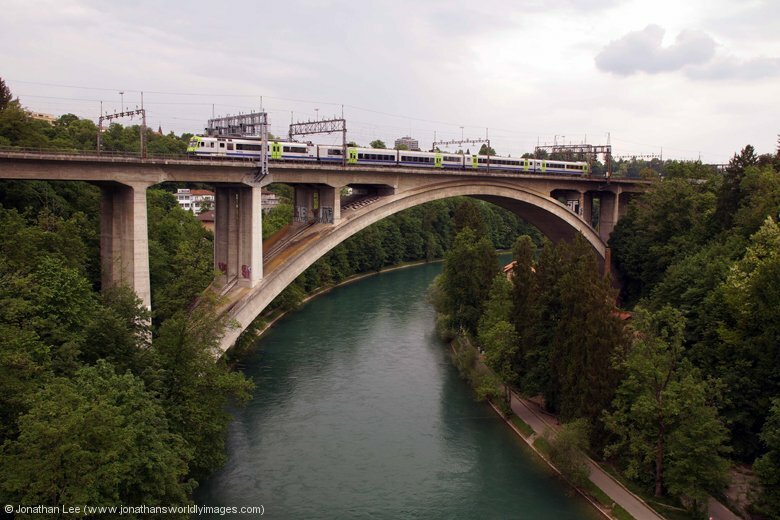 Either way my attentions turned to the Zurich S-bahn as I noticed 450002/450110 running into Hardbrucke as we passed by, both of which were new; so immediately downstairs it was to investigate, having checked the big screen to find no “ersatzug” at all before I went down. Sure enough 450002/450110 rocked up shortly after I made it downstairs and I even managed to wait it out for another new 450 back to Zurich Hbf before I decided to head down to platform 31 and do IR2231 1742 Zurich Hbf – Luzern via Enge to Zug to then do IR2433 1809 Zurich Hbf – Chiasso forward. All was well as I sat waiting at Zug, Chinese takeaway to hand, having been delivered there by 11151; then 460038 rolled in with IR2433. 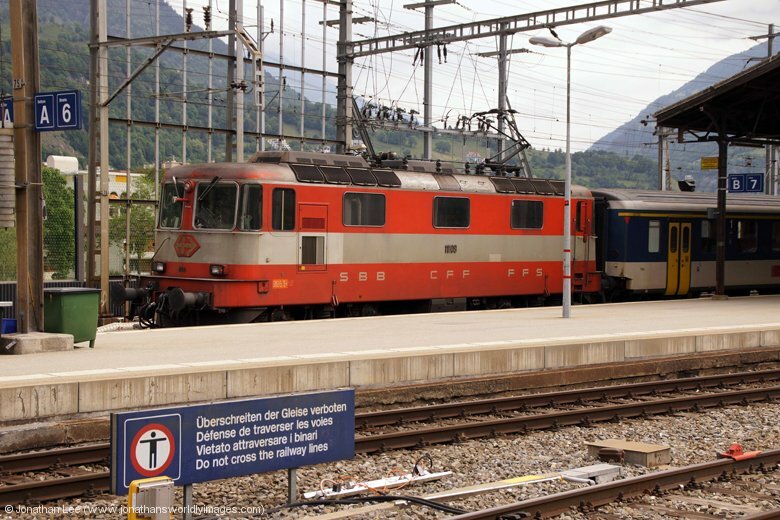 It wasn’t quite what I’d been expecting, knowing SBB had to provide a fresh loco for the train, especially as there seemed to be a few Re4/4’s on shed at Zurich. 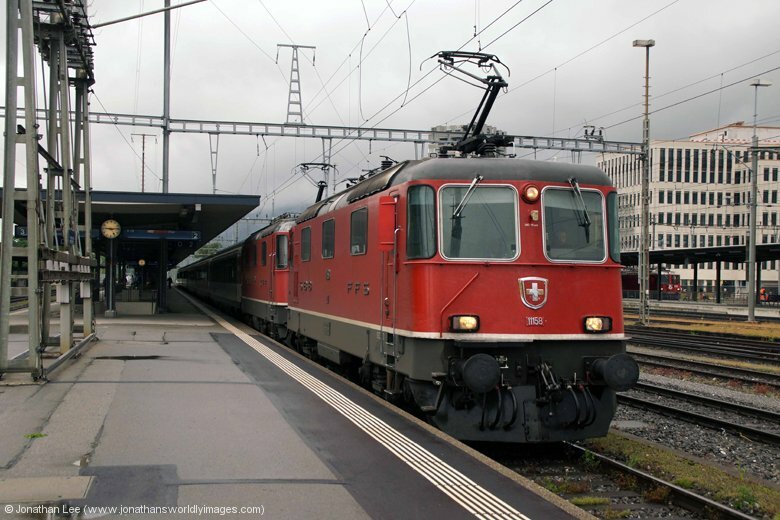 The consolation was that at least it was new and actually made the plus 2 at Arth Goldau onto VAE2584 1705 St Gallen – Luzern. I wasn’t quite fancying doing the 1940 Voralpen Express out of Luzern so was quite pleased I’d made 446017/446015 on the inbound as I’d hoped. Although not keen on doing the Voralpen Express back out I spotted 460048 with the 1935 Luzern – Zurich Hbf and decided I’d get that in on its return. 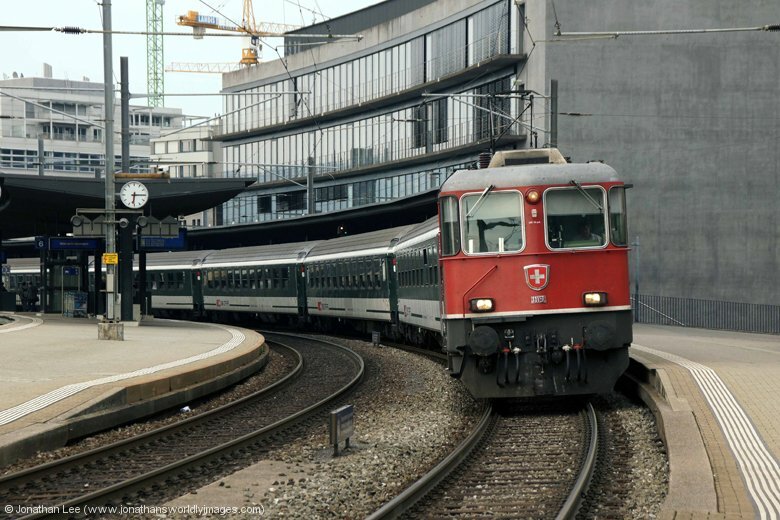 I’d have a quick trip to Sursee in the meantime to get 460034 in on IR2485 1917 Basel – Luzern, which I’d spotted at Luzern earlier with the 1100 Luzern – Geneve Aeroport, assuming it stuck to diagram of course. Both my out and back to Sursee and my consequent out and back to Rotkreuz went without a hitch and revealed what I’d expected coming back in, both 460034 & 460048 having stuck to diagram. 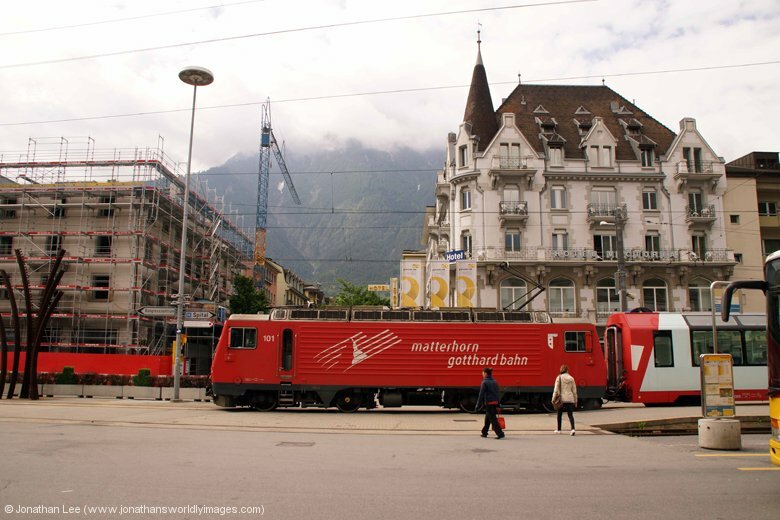 What I spotted in between the two moves surprised me a little, as I found SBB Cargo 421384 on the blocks having arrived with VAE2586 1805 St Gallen – Luzern with 446016 on the rear. 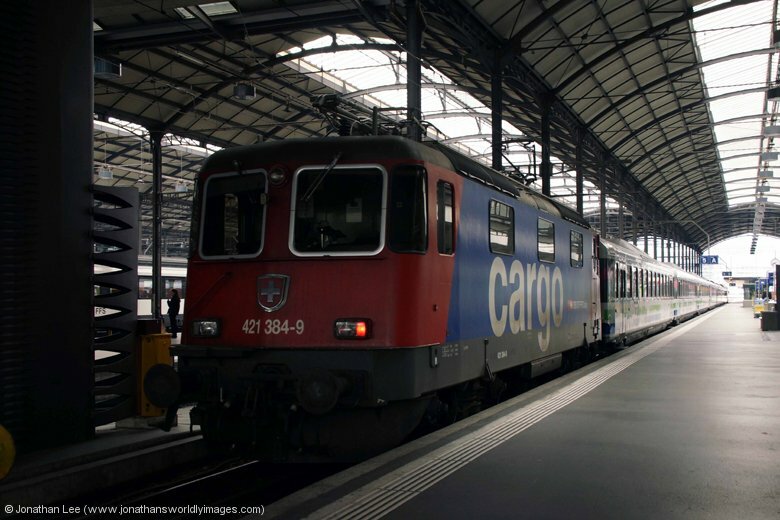 I’d not seen any mention of an SBB Cargo loco being on hire to SOB since before the New Year so just assumed that those kind of shenanigans had ceased; clearly my assumptions were wrong. So the question I couldn’t answer was; had 421384 been permanently on hire all year or had it actually been off hire and then randomly been in the right place at the right time when SOB had asked for a hire loco again and returned to SOB when they asked? If it was the latter I was a little disappointed that SBB Cargo couldn’t rustle up a different loco from their vast fleet as it would have given me something to do the following morning; as it stood my plan was to get up early and cover the three Re4/4 pair turns out of Luzern on a Saturday, before heading Geneva to meet my wife at the airport. Having checked in to the Erlebnishotel Jailhotel in the afternoon I was thankful I didn’t have to mess about too much when I got there. The place is about a 7 minute walk from the station and if you cross the river via the bridge next to the Kappelbrucke and basically walk straight you won’t miss the hotel. It is about as basic as it comes with each room being an old jail cell, mine had two single beds in it, a sink and a toilet with shower. The rooms are small and don’t have a lot of space at all but the water is piping hot and the doors very secure; obviously! If you’re just after a place to stay for the night, or a few nights, where you will just get clean and sleep then it’s perfect. Breakfast isn’t included in the room rate, which is CHF15 extra and probably helps keep the room costs down. WiFi is available but only really in the reception area; to be honest the hour’s free WiFi through SBB at Luzern station was better! There is a nightclub below the hotel, which is mentioned on the booking.com confirmation sheet. I asked whether I’d be disturbed by the music and was told not on the second floor, where I was, but those on the first floor might still be able to hear it. I was given a pair of earplugs by the girl at reception, just in case! I heard no peep from the nightclub at all and there was no noise from outside either; I literally slept like a log until my alarm woke me at 0545! 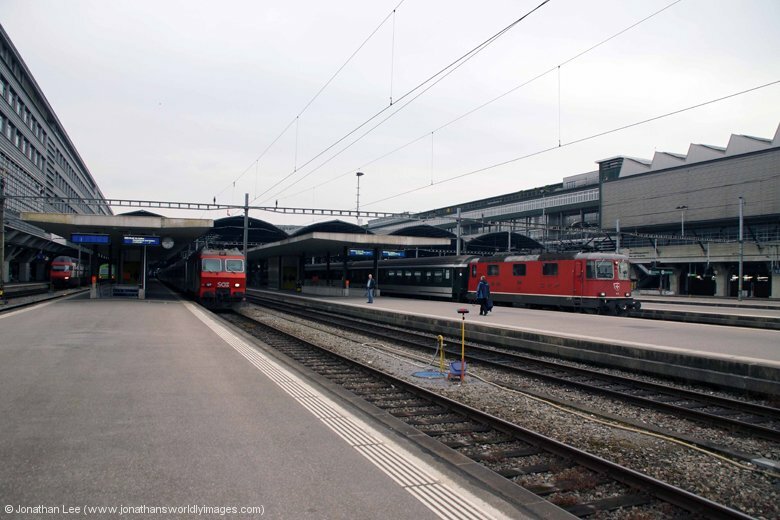 I didn’t waste much time and was at the station for just after 0600 to find 101964 with IR2958 1010 Luzern – Engelberg and two Voralpen Express sets berthed in the far right of the station; one set had EMU cars 081/084 wrapped round it and the other SBB Cargo 421384 & SOB 446016. The set for IR2458 0630 Luzern – Basel was already in and unfortunately only had a single Re4/4, 11146, at the head of the train; which was a load 14 set! 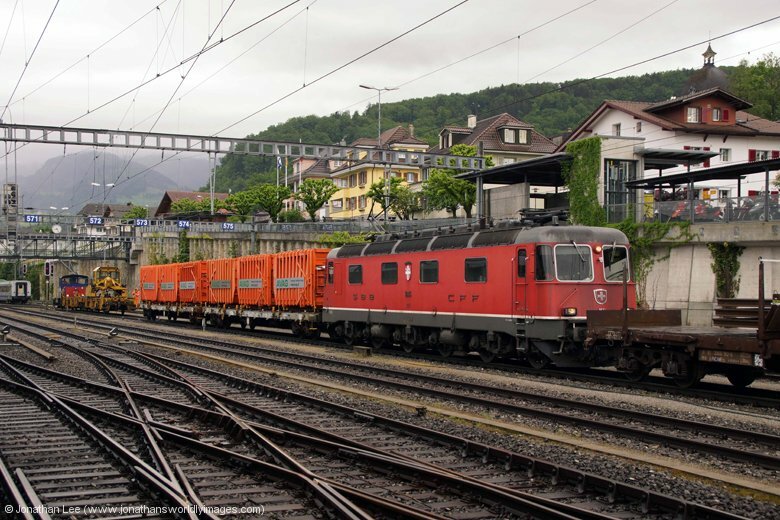 Re4/4 11155 was at the head of IR2307 0504 Basel – Locarno with a Re460 having worked it in; that too was a decent sized rake as a load 11 set! 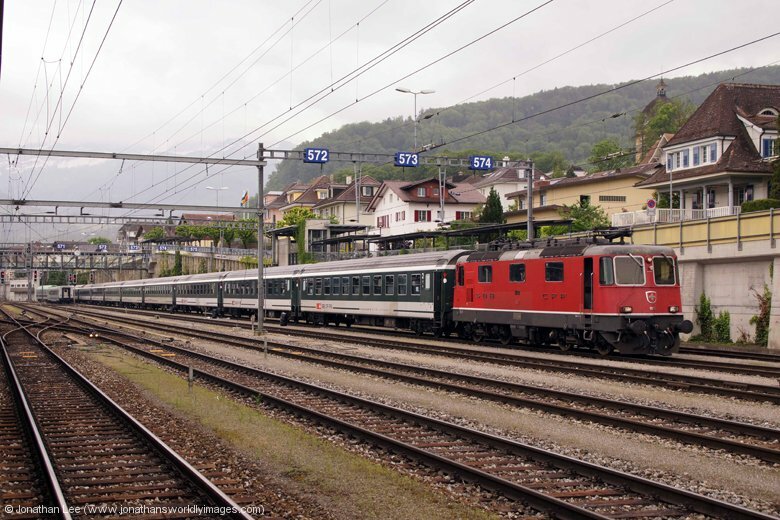 Disappointed that I’d got up so early for a single Re4/4 vice a pair I did the train to Sursee anyway where at least I dropped onto a new Re460 back in, in the shape of 460106 with IR2459 0617 Basel – Luzern; which then worked IR2512 0800 Luzern – Geneve Aeroport. 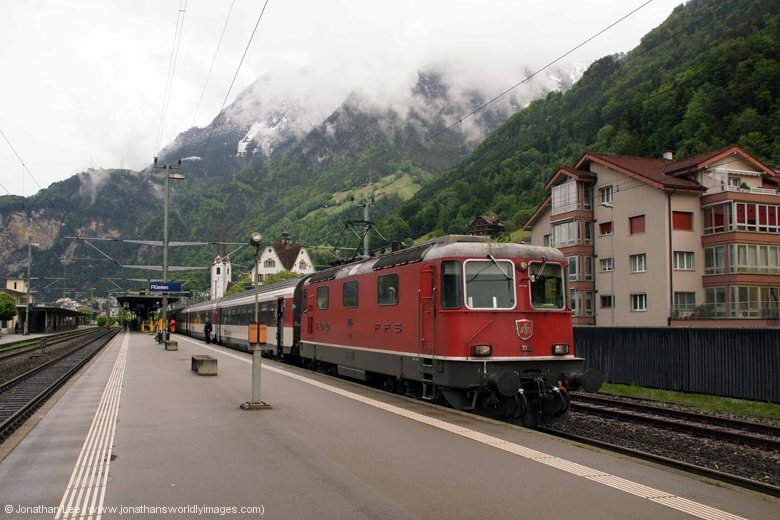 I soon figured out, after about an hour of watching trains come and go, that staying at Luzern for the morning wasn’t going to benefit me and having viewed 101968 on the second ZB Engelberg turn, as it arrived with IR2963 0801 Engelberg – Luzern, two of the BLS Luzern – Bern turns, with 465004 on RE4362 0757 Luzern – Bern and Re420, 420505 on RE4359 0636 Bern – Luzern, a raft of dud Re460’s and enough Re4/4’s to be able to work out what would do what as regards the other two pair turns of the morning I decided to call it a day and head towards Bern to see what was on offer there. 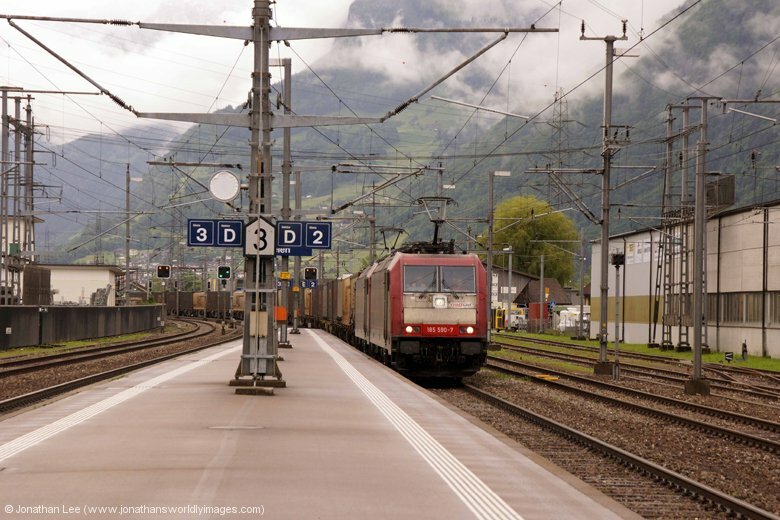 I’d seen Re4/4’s 11151 and 11153 arrive into Luzern, with IR2311 0604 Basel – Locarno and IR2313 0704 Basel – Locarno respectively, and both were paired and shunting some coaches out of the yard to attach to the front of IR2314 0547 Locarno – Basel as I departed with BLS Re420, 420505, on RE4364 0857 Luzern – Bern. Re4/4 11150 sat on the blocks, having worked IR2314 into Luzern and should then be one of the pair on IR2316 0747 Locarno – Basel from Luzern. Re4/4 11125 had departed shortly before with EC153 0847 Luzern – Milano Centrale and Re4/4 11130 shortly before that with IR2313 0704 Basel – Locarno with SBB Cargo 421384 / SOB 446016 having done VAE2569 0840 Luzern – St Gallen. BLS 465006 passed me just outside Luzern with RE4361 0736 Bern – Luzern and Re420, 420504, at Schupfheim with RE4363 0836 Bern – Luzern and then I spotted 465003 in the sidings as I arrived into Bern, which would work RE3928 1057 Bern – Neuchatel. 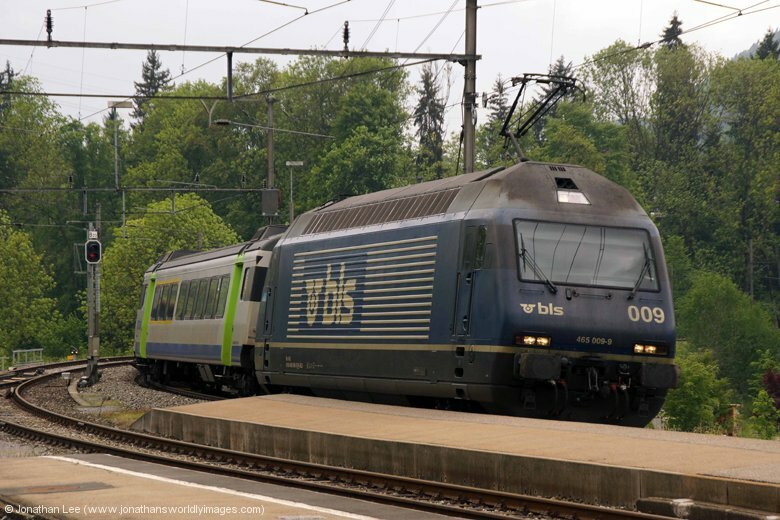 I didn’t have to wait long for something to materialize at Bern and was soon Burgdorf bound with 460037 on IR2367 1039 Bern – Zurich Hbf, for 460100 back in on IR2364 0957 Zurich Hbf – Bern; which put me nicely into the next one on, 460101, on IC1067 1031 Basel – Domodossola to Thun for 460063 back on IC1069 1120 Brig – Basel. As I arrived into Bern Re4/4 11192, which I needed, was just departing from the higher numbered platforms and unfortunately I couldn’t quite tell what stock it was on, although I did make out the word “express” on the front coach before the set disappeared from my line of view thanks to another train; it was a mystery to me as to what it was on and the departure boards revealed nothing! 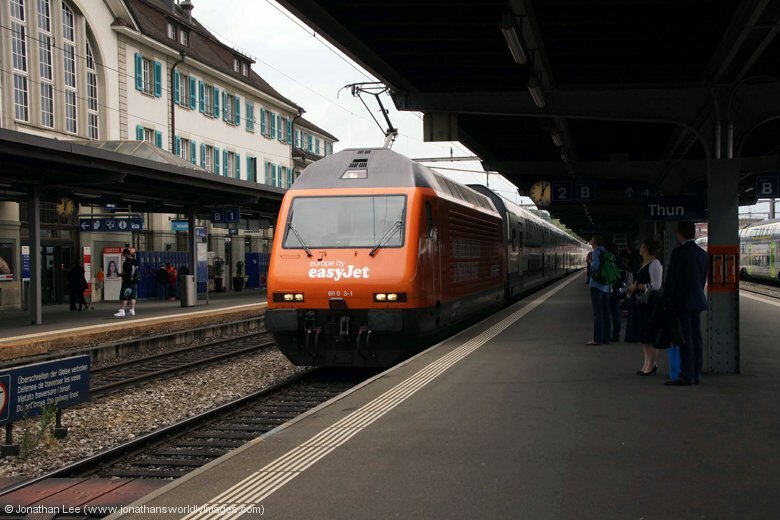 As I needed to be in Geneve to meet my wife at the airport at 1645 I had a plan to get there, which would hopefully involve 460023, assuming it stuck to diagram and turned up on IR2520 1200 Luzern – Geneve Aeroport. Meanwhile 460021, on IC716 1011 St Gallen – Geneve Aeroport, was the next thing bound for Fribourg so it would have been rude to flag it a new one; and when 460023 turned up at Fribourg as per diagram it topped off a five new from six moves morning in Bern, with more to come. 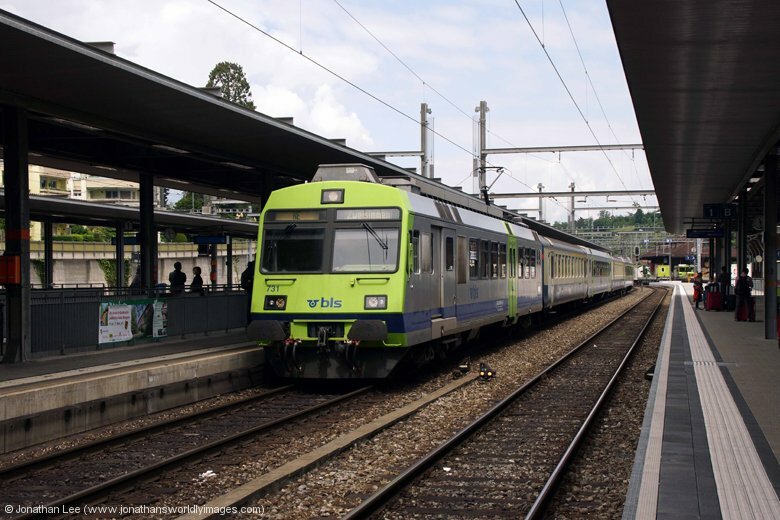 The plus 4 at Bellegarde made easily and 22393 arrived bang on time into Geneve with the 1423 Lyon Perrache – Geneve, which gave me enough time to do 460041 into the airport on IR1728 1358 Brig – Geneve Aeroport and quickly walk the few minutes it took to the arrival gates; knowing my wife’s plane was late anyway as she’d text me before she took off. Leaving Luzern was the best move I could have played that morning and it turned into a very good afternoon’s bash indeed and was finished off nicely with 460046 on IR1735 1824 Geneve Aeroport – Brig; which we did throughout and then checked into the Good Night Inn in Brig, which is about 7 minutes from the station, straight up the rod opposite the station entrance, bare right through the square at the top, over the river, turn right immediately after it and the hotel is on the right. On this visit to the Good Night Inn we were given a room on the fourth floor, which had a great view of the mountains out of the windows. It was a sizeable double room with a huge flat screen TV, decent free WiFi with no messing about to connect and breakfast was included in the room rate. I’d booked through booking.com and paid the whole bill as we checked in. No time was wasted in getting some food that evening and the restaurant we always used, the Channa Restaurant, which is only a few minutes’ walk from the hotel, was in full swing when we arrived. Food is quickly prepared and pizzas are made in front of you if you sit inside and watch the pizza maker do his thing. Our pizzas were excellent and didn’t touch the sides. The average pizza price at the Channa is about CHF20 and they’re generally cheaper than most other things on the menu but don’t let the price put you off as the food is very good. Having been subjected to a few miserable days in Switzerland we made plans to head to Mt Titlis the following morning, mainly as it looked like it would be the best day to do so weather wise. Of course if I’d planned the trip properly we’d have been heading up to the Aletsch Glacier instead, as originally planned, but Titlis was about the closest alternative at a mere 3 hours from Brig to Engelberg; and that didn’t include getting up to Titlis from Engelberg! An 0630 alarm call had us down to breakfast at 0700 on the dot. The Good Night Inn breakfast is usually a free for all with the amount of seniors that usually stay and are on organized tours starting early in a morning; on this occasion though we beat them all down and had the pick of the freshly laid out spread, which lacked croissants! Fed and with a bit packed up for later we were at Brig station by just after 0730 and on board IC811 0749 Brig – Romanshorn, with 460008, for part one of the journey to Engelberg; having spotted MGB Deh4/4 #53 with 513 0656 Fiesch – Visp. 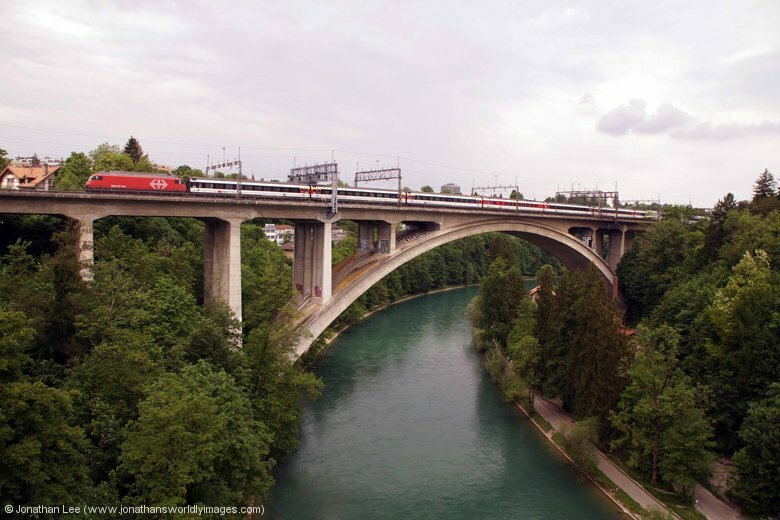 With only a few minutes at Bern to change trains we lagged it over the footbridge and did 460033 to Luzern on IR2517 0702 Geneve Aeroport – Luzern where ZB’s 101968 was sat waiting with IR2966 1010 Luzern – Engelberg; which is where the disaster started to unfold, although not quite on the scale we were going to walk into at Engelberg! Even at load 7 the train was wedged, with both Indian and Chinese tourists, and we had to stand all the way to Engelberg; we crossed 101964 at Dallenwil with IR2967 1001 Engelberg – Luzern and both 101961/101965 were on shed at Stanstadt. Engelberg station looked like it was mid-refurbishment and looked like a building site; which would probably explain why the line had been closed north of Wolfenschiessen for a month. Outside the front of the station is a bus stop for a free bus to take you to where the Titlis cable car’s start from. We thought we’d avoid the tourist trap and walk; to hopefully beat the bus load there and get ourselves sorted before they arrived. We’d arrived at Engelberg at 1053 and I’d originally allowed for 3 hours to get up Titlis and back, to be on the 1401 train back towards Luzern; we got out of the cable car at 1503, having missed the 1501 train my minutes and then had to wait until the 1601 train back to Luzern. Our day had been nothing short of a disaster really and we’d paid CHF44.50, each, for our lunch outing! And that was half the full price thanks to our Swiss Passes. While we were queuing up people were shelling out as much as CHF700 for a family to go up the mountain, which is a ridiculous amount of money to then have to endure what people did; and for what at the end of it? Cloud…. ZB’s 101964 headed IR2979 1601 Engelberg – Luzern down the hill to Luzern and passed 101968, still working the other turn, at Dallenwil with IR2978 1610 Luzern – Engelberg. 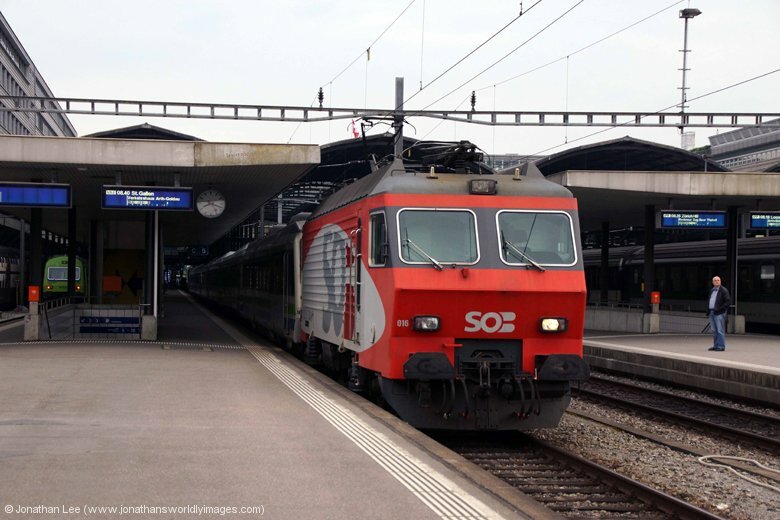 There was no hanging around at Luzern as SBB 460005 sat waiting to depart with IR2530 1700 Luzern – Geneve Aeroport; as dud BLS Re465, 465006, was sat with RE4380 1657 Luzern – Bern there wasn’t really a decision to be made and 460005 made perfect sense. At Bern there were a lot of people flitting between platforms to make their connections and as some of the connections re only 3 minutes its sometimes quite hard getting from one platform to the other at Bern in time due to the location of the underpass and over bridge. 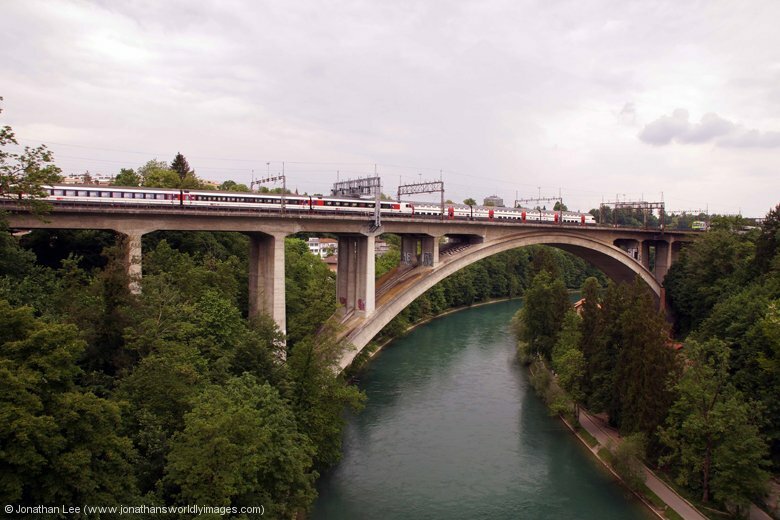 We managed to make our train though, IC826 1541 Romanshorn – Brig, which was sat waiting to go with a new 460025; in the adjacent platform was IC979 1659 Basel – Interlaken Ost with new 460075 so the latter got done to Thun as it departed 3 minutes in front of IC826 and by the time we’d walked under the subway at Thun IC826 was bowling into the platform. We got off at Visp to get some supplies from the Migros at the station, knowing it would be our only likely chance with it being a Sunday. 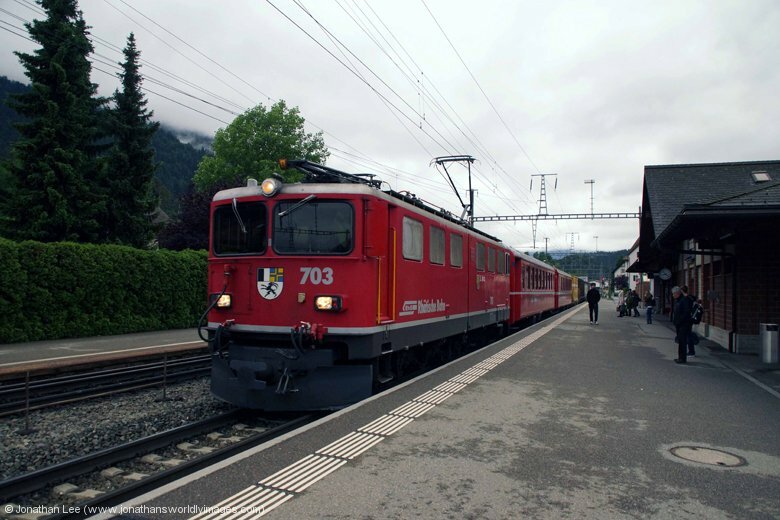 MGB Deh4/4 I #52 whisked us back to Brig Bahnhofplatz afterwards on a very empty 562 1908 Visp – Andermatt and we walked straight to the Channa Restaurant, where a good meal was enjoyed again. 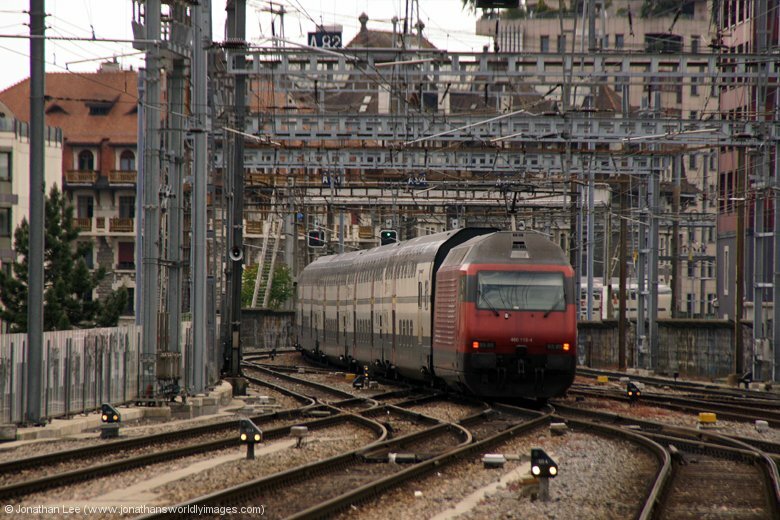 Later that night I nipped back to Brig station to have a check on what was going off with the Re4/4 turns, especially 27939 2119 Brig – Iselle car train and IR1844 2128 Brig – Geneve Aeroport; the former would have been a new introduction to the Brig circuit, having arrived off IR1743 2223 Geneve Aeroport – Brig in the small hours, and the latter would disappear from the Brig circuit that night. I’d spotted one of the old liveried Re4/4’s at Brig when we’d arrived the previous night and had assumed it to be 11109 as I’d seen 11108 at Zurich the day before; as I needed 11109 I wanted to try and keep tabs on it and it wasn’t long before I found it. My trip out became quite easy in the end and as I was walking down to the car train loading dock I noticed 11109 in the yard, attached to a push-pull set. 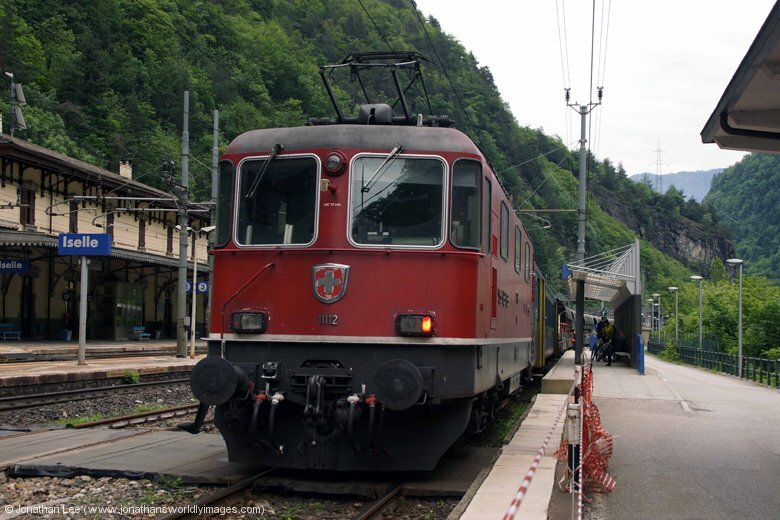 Based on the Re4/4 diagrams I assumed this would work IR3317 1044 Brig – Domodossola the following day as the other two push-pull sets were already at Domodossola for the morning commuters. 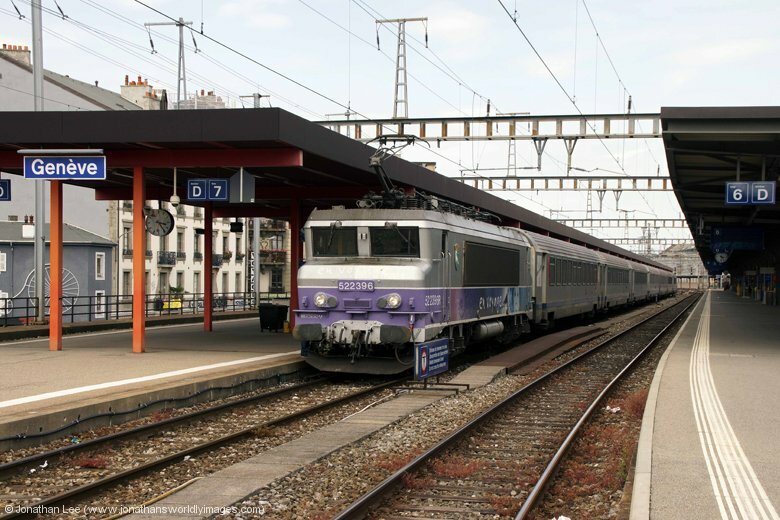 The next surprise was finding Re4/4 11112 on 27939 2119 Brig Autoquai – Iselle, which was another new one and set my morning move up as it was diagrammed to stay on the car train until late morning the following day. Having found 11109 I wasn’t so bothered about IR1743 at 2128 anymore and ultimately did 460108 to Visp on IR1742 2058 Brig – Lausanne for 460057 back on IC830 1741 Romanshorn – Brig; Re4/4 11157 ended up doing IR1743 2128 Brig – Geneve Aeroport. While it hadn’t been the most successful of days out I’d at least managed to find some new Re4/4’s buried in the Brig circuits and could work out what to do the following day; meanwhile a leisurely day was planned in light of the fiasco we’d endured on this day! Having got myself out of bed at 0645 I was pleased to find Re4/4 11112 still attached to the car train when I got across to do 27911 0736 Brig – Autoquai – Iselle di Trasquera. 11109 was still sat where it had been the previous night, which was a good sign and the trip to Iselle was about as simple as they come, it was empty on the outward but quite full on the return. On arrival back into Brig Autoquai 11112 was removed from the train a trip earlier than it should have been but I didn’t see what replaced it. I can only assume, based on viewings that evening that it was green Re4/4 11161. Pleased with how the morning had started I went straight back to the hotel for a leisurely breakfast before we set off for Bern, a little after 1000. A pleasant surprise rolled into Brig Bahnhofplatz as we stood outside the main station watching a Glacier Express train load up; said surprise was MGB Deh4/4 II #96 with 529 0837 Andermatt – Visp and the Glacier Express train was GEX902 0852 Zermatt – St Moritz headed by MGB HGe4/4 II #101. 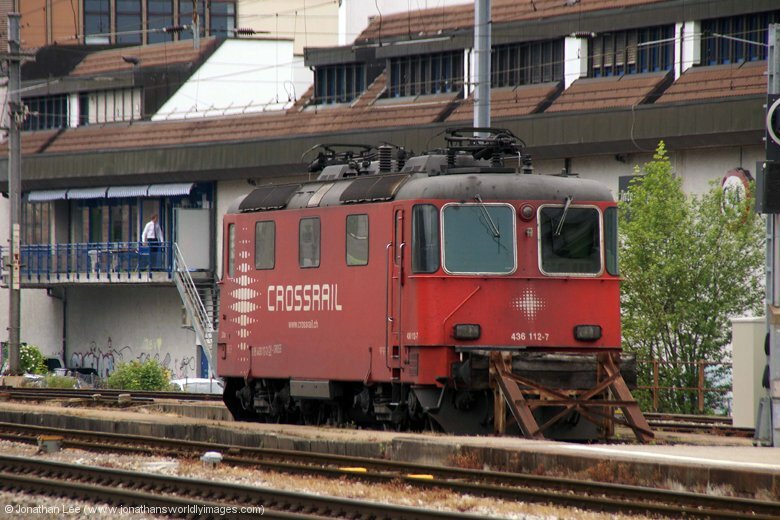 As 96 was new we did it through to Visp and boarded IC817 1049 Brig – Romanshorn there, which was pushed by 460102. Before departing though I did check to make sure Re4/4 11109 worked IR3317 1044 Brig – Domodossola, which of course it did and set up my move for later that evening; or so I assumed at the time! Instead of heading straight to Bern we got off at Spiez as the view of the lake, directly outside the station entrance, is quite atmospheric when the weather isn’t so good, as it was on this particular morning; Spiez castle is also clearly visible on the lake’s edge as well. 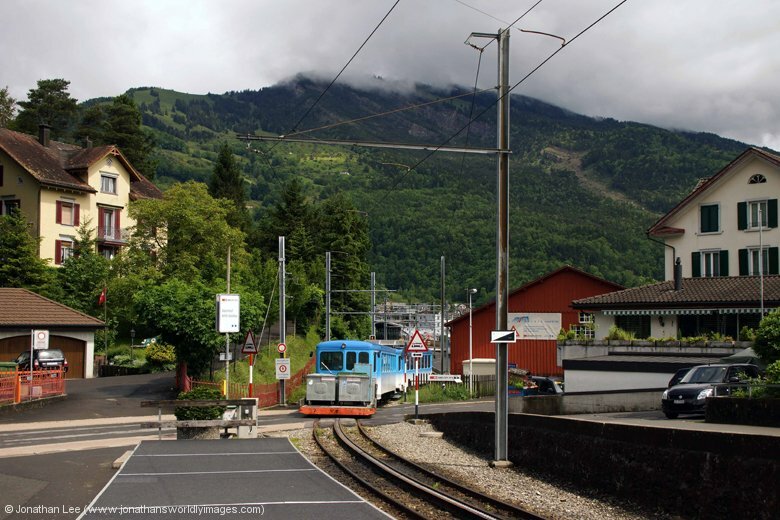 According to the signs outside the station it takes about 15 minutes to reach the castle, from outside the station, but the weather put us off even attempting to take the walk down so we headed to Bern on the next train, 460014 delivering us there on IC1068 1120 Brig – Basel. After a short walk round lunch seemed like a sensible idea at that point and we found a nice Italian type take-away next door to McDonalds downstairs at Bern station. There was a little room to eat in and so we did, the pasta was cooked fresh and the whole meal was piping hot throughout. With no real inclination to do tourist related activities, what with the weather not being too good and the previous day having worn us out, it was easier to do a few train relate bits that afternoon. Having spotted BLS Cargo Re465, 465007, working the Bern – Luzern circuit the previous day I was keen to see if it was out again but having seen Re420 420504 depart Bern with IR4371 1236 Bern – Luzern, while we’d been on the road bridge earlier, and then finding Re420, 420502, with IR4373 1336 Bern – Luzern I wasn’t holding out much hope. 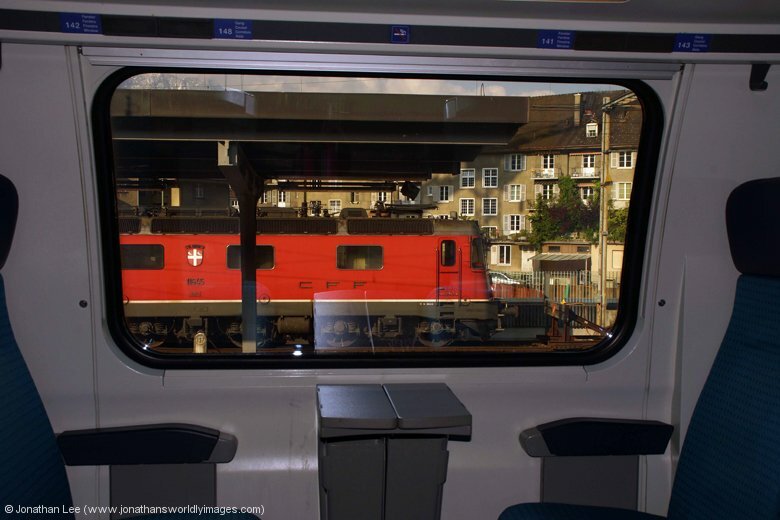 I thought it could have ended up on one of the Neuchatel turns as well but one of those had been an EMU and an Re420 had been sat in the sidings at the Neuchatel end of Bern station when we’d arrived that morning, which I assumed would be the other turn. With no other plans and no real meaning to the day we did 420503 out to Konolfingen anyway to view the third of the four BLS Re465 turns and bugger me if it didn’t turn up with 465007 which was a nice bonus. After that we headed back towards Brig in readiness for doing the 1744 Brig – Domodossola out with 11109; we were sidetracked at Spiez though, having done 460004 there on IC1073 1331 Basel – Interlaken Ost, by two things! The first was Re4/4 11192 sat in the sidings adjacent to the station with a load 10 fresh air set, which I can only assume was possibly a football special to Thun? 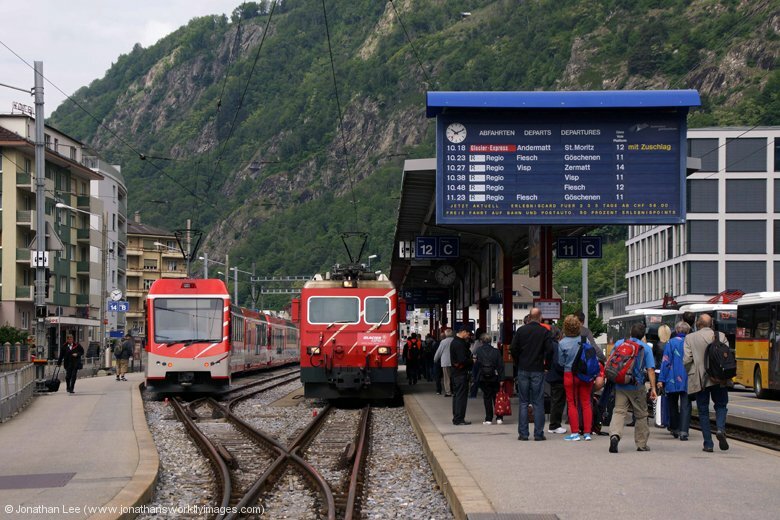 The second was the Extrazug that was showing on the screens to Thun and formed of loco and stock according to the platform departure screens. I figured that this would be the extra train that ran at a weekend from Brig to Thun, having gone Bern – Brig that morning, and when BLS 465001 arrived with it my suspicions were confirmed; however I couldn’t find the train anywhere on the Hafas system to confirm what it actually ran as when I checked later! 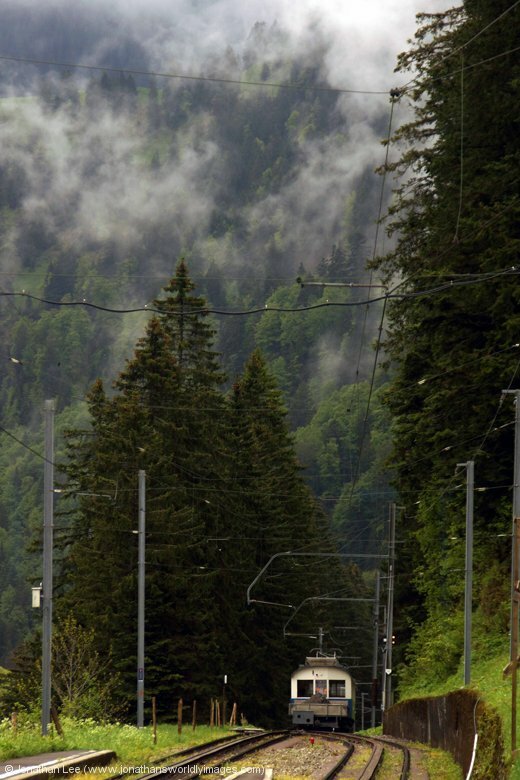 One thing the train running did confirm was that it was a bank holiday in Switzerland and that message would be rammed down my throat a little later as well. 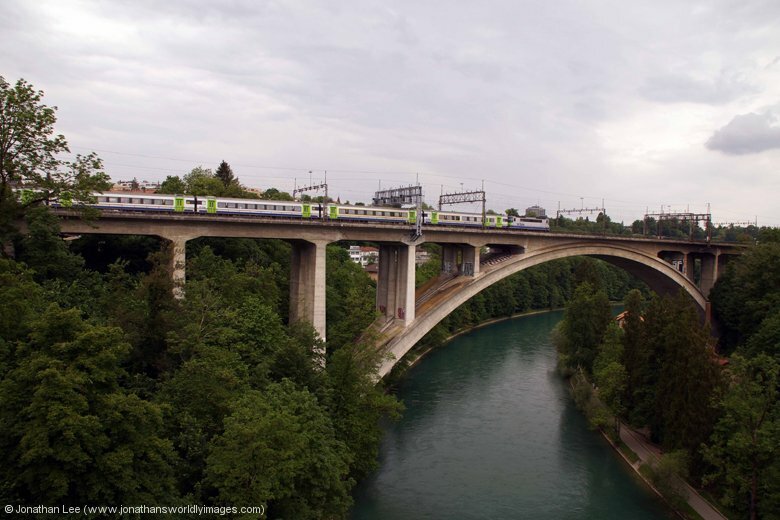 For the time being though 465001 got done back to Thun for 460014 to Visp on IC1075 1431 Basel – Brig and 460025 to Brig on IC822 1341 Romanshorn – Brig. At Brig that evening things became interesting and it wasn’t until I noticed that RE6381 1744 Brig – Domodossola was missing from the departure screen that I’d even considered checking the timetable; sure enough, as it was a bank holiday, RE6381 didn’t run as it was a Monday to Friday only commuter train. 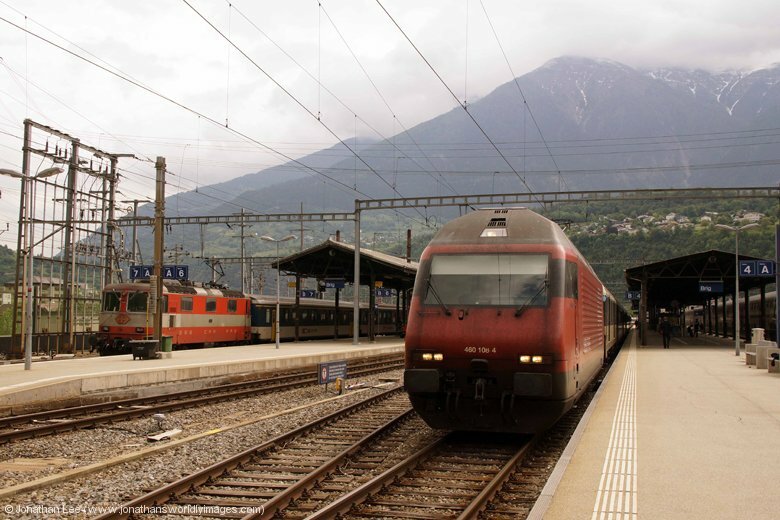 Strangely though the 1644 and 1844 trains to Domodossola did so having watched Re4/4 11109 arrived from Domodossola with IR3328 1648 Domodossola – Brig and then checking that there wasn’t anything to be concerned about on 27931 1736 Brig Autoquai – Iselle car train, we went for some food at the Channa restaurant and I contemplated what might or might not happen over dinner! Having figured out that whatever happened something would have to get back to Domodossola that evening to be the second engine to work EN220 Milano Centrale – Paris Thello train I was convinced that RE6383 1844 Brig – Domodossola would end up being two push-pull sets and formed of 11109 + set and whatever arrived at 1816 with IR3330 1748 Domodossola – Brig; so after dinner a trip back to the station was in order to find out. There wasn’t anything in platform 7, where the 1844 Domodossola was shown to go from, which was a good sign of course and then when I clapped eyes on a push-pull set being shunted out of the yard and then saw 11109 sandwiched in the middle I believed my suspicions were correct; but no, they were only half right! 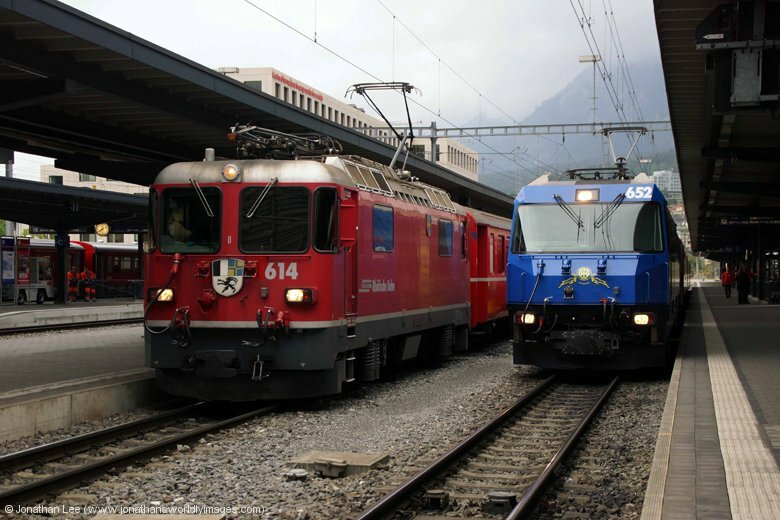 For some reason it appeared that the engine that had arrived with IR3330 had gone back light to Domodossola and 11109 was sandwiched in the middle of two sets and worked RE6383 1844 Brig – Domodossola on its own. The rear set was locked out throughout and Re4/4 11161 was the only other Re4/4 at Domodossola when we arrived, with no other sets there at all; which is what led me to believe it had both gone back light and been the loco that had replaced 11112 on the car train that morning. Either way some FS shunting device was on hand to split the sets on arrival and 11109 was released to pair up with 11161 to then work EN229 to Vallorbe that night. It was a very unique combination of nostalgic liveries of course with 11161 being in the old green livery and 11109 being in old SBB two tone red; it was a shame nobody would see then under the cover of darkness. There were plenty of engines scattered about at Domodossola, mainly BLS Cargo locos and two FS E464’s on sets, one in the platform to work the 1956 departure to Milano P. Garibaldi and the other spare in the sidings. 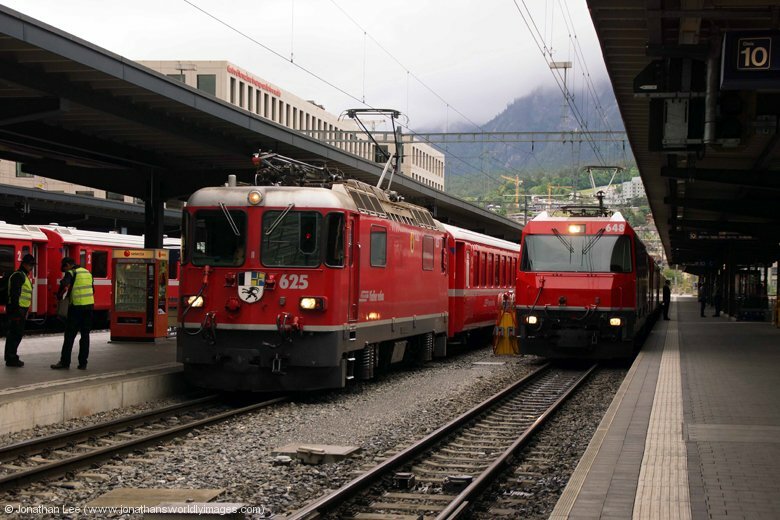 We had an option of two trains back to Brig, unfortunately both were Euro City trains formed of SBB ICN sets. The first came in absolutely rammed and was obviously even more rammed when those on the platform crammed themselves in. 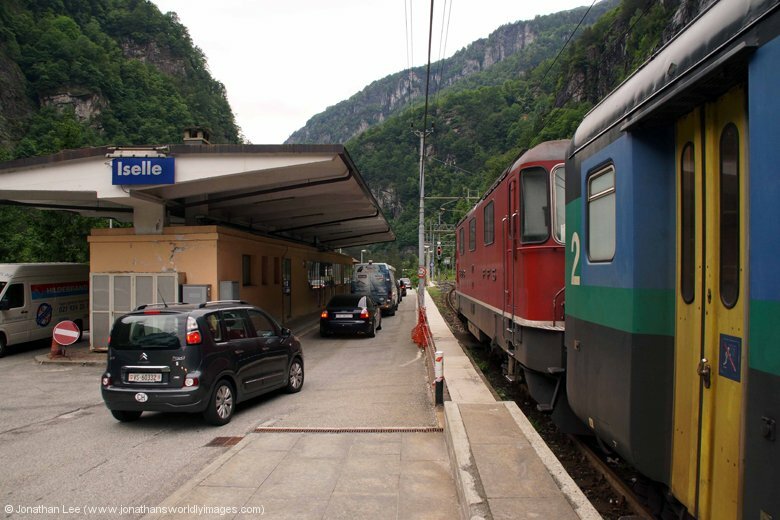 The was a bit of a commotion occurred when the guard on the first EC train wanted to get rid of the train while people were still running down the platform, having arrived on the Centrovalli platforms from Locarno. It took a member of station staff to stop him from departing, who then just gave up himself and looked to just tell the guard to get on with things as he pleased; and that’s exactly what he did as EC320 1808 Rho Fiera Expo Milano – Geneve set sail for Switzerland. As it turned out it looked like most people who’d turned up wanted to head towards Brig and Basel anyway so there didn’t seem to be any complaints but EC56 1823 Milano Centrale – Basel was equally as rammed behind EC320 and we had to stand in the aisle all the way to Brig. Thankfully keeping the door open at the coach end let enough air-conditioning into the coach corridors to give us a bit of air to breathe instead of melting in the warmth. At Brig IC10056 2018 Brig – Bern had been held to await EC56’s arrival, it clearly being a relief to EC56 and was completely empty when we arrived. We didn’t hang around to see how many people actually realised they could have a seat to Bern if they walked the 10m across the platform but it didn’t look like many as we walked down the steps and under the subway. Having eaten early it made a pleasant change to be able to amble back to the hotel rather than do food first and this allowed me to figure out exactly what we should do the following morning; having decided we’d visit Mt Rigi, which overlooks Lake Luzern. Whichever way I looked at getting from Brig to Rigi it was evident it was going to take a while and with options via Andermatt & Göschenen to Arth Goldau, Zurich to Arth Goldau and Bern & Luzern to Arth Goldau I opted for the non-conventional way of doing it via Bern, Olten and Luzern to Arth Goldau. 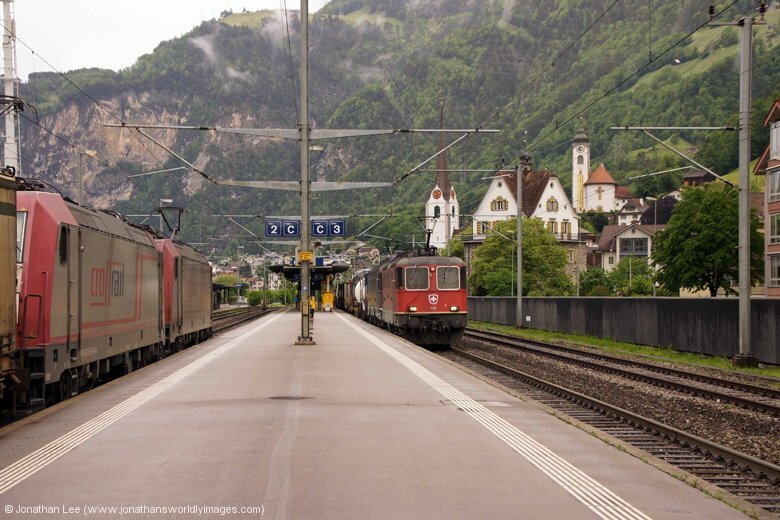 Having done 460025 to Spiez, 460014 to Bern and 460027 to Olten, on IC811 0749 Brig – Romanshorn, IC1062 0830 Interlaken Ost – Basel and IR2167 0936 Bern – Zurich Hbf respectively, this allowed for a move towards Arth Goldau involving Re4/4’s on the Gotthard Pass trains. En-route to Olten SBB Re6/6 11645 was seen at Spiez with an infrastructure train round the back of the station and I had chance to spot BLS Re465, 465006, at Bern with RE4365 0936 Bern – Luzern; which had it been an Re420 it would likely have been done to Luzern. 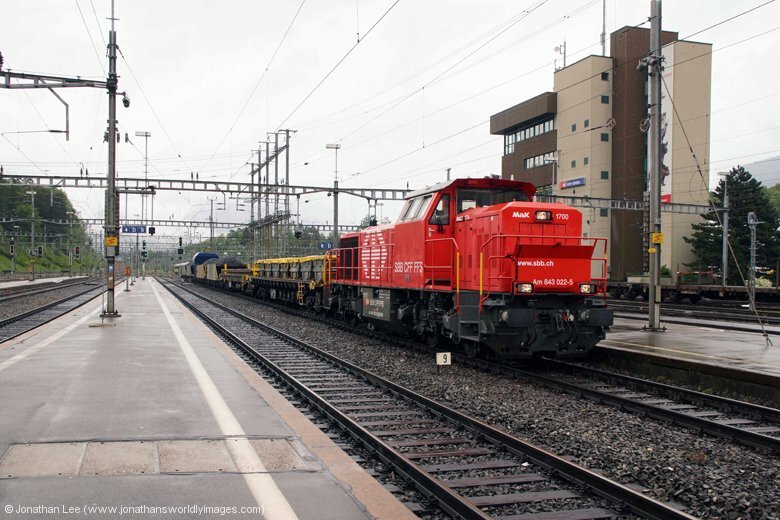 While waiting at Olten it was busy with freight passing through, the anomaly of the morning being a BLS train headed by a Re465/Re425 combination and if that wasn’t strange enough it was passenger sector 465002 leading “brownie” 171. Our IR2319 1004 Basel – Locarno wasn’t far behind it and arrived about 5 minutes late with Re4/4 11200 and no sooner had it arrived on the blocks at Luzern did Re4/4 11141 drop onto the opposite end of the train to work forward to Locarno; which was a bit of an unexpected bonus as it was a new one for me and one I hadn’t seen thus far on this trip. En-route from Luzern to Arth Goldau, via Rotkreutz, the heavens opened and it bounced it down but by the time we got to Arth Goldau the rain had stopped and clouds bumbled around in the valley’s, not quite gaining enough lift to clear the ridges, and the sun began to shine through making for quite a warm, yet fresh, afternoon. 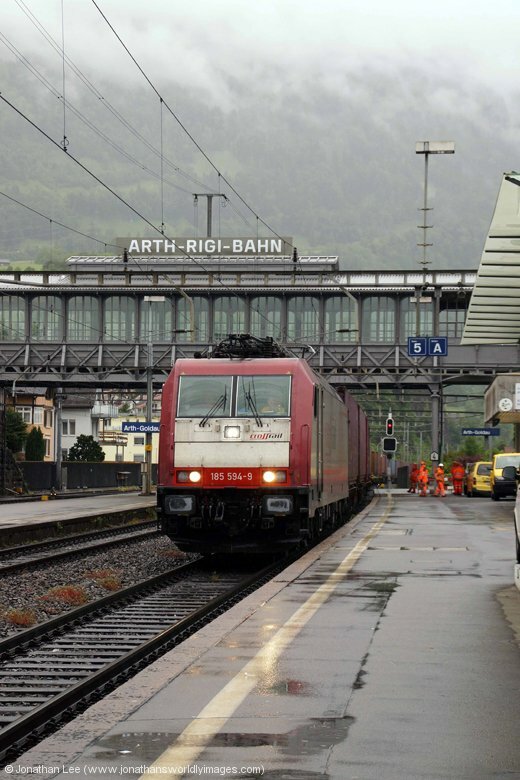 Rigibahnen is usually situated at the Arth Goldau station, which is housed in a wooden building that spans the Arth Goldau to Luzern direct route, clearly visible at the Luzern end of the station with wording on the structure to confirm it if there was any doubt. 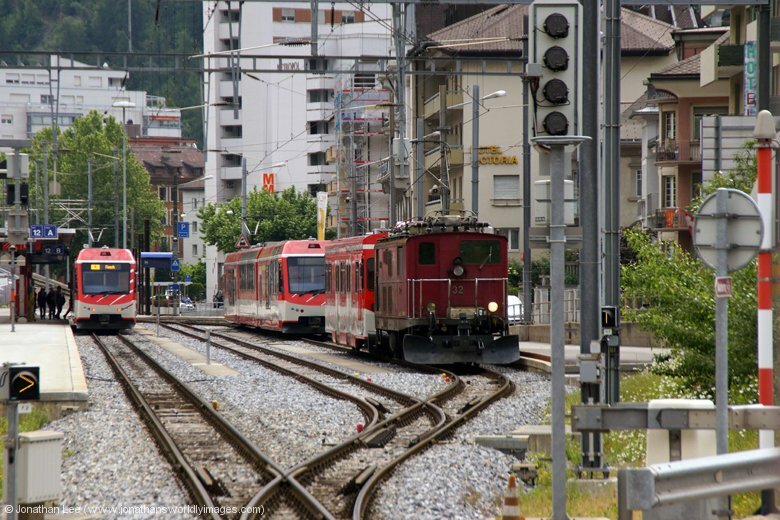 At the moment this station is closed and trains are starting at Goldau station, which is a comfortable 10 minute walk (could be done in 5 if need be) from SBB’s Arth Goldau station and is clearly signposted out of both entrances; the shortest route being out of the underpass entrance. There’s a makeshift station building with ticket office at Goldau and everything you need to know can be found in the office, including of course timetables for the trains, as well as timetables for the boats on Lake Luzern; which come in handy if you plan to end up at Rigibahnen’s Vitznau station on the lake. 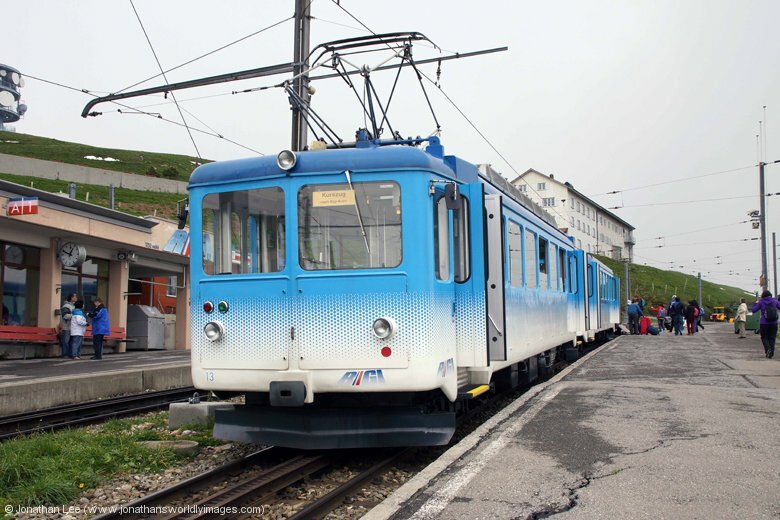 RB’s 1210 Goldau – Rigi Klum service was formed of load two with the powering vehicle being 1949 built BDhe4/4 #13. 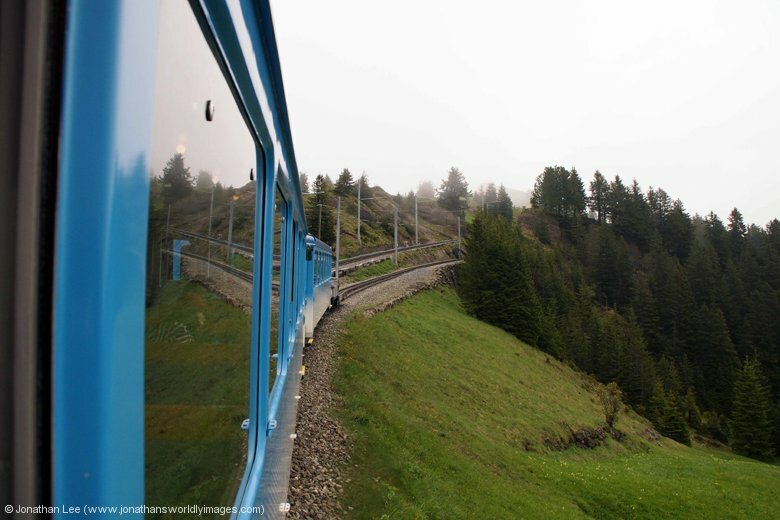 The train wasn’t full and the climb up to Rigi was quite fascinating really and very atmospheric as we headed into the low clouds. Unfortunately though we never came out of the clouds and our view at the top was pretty much as crap as it had been at Titlis two days previous; the only difference being was that we hadn’t paid for this trip as it was free with Swiss Passes on board Rigibahnen. 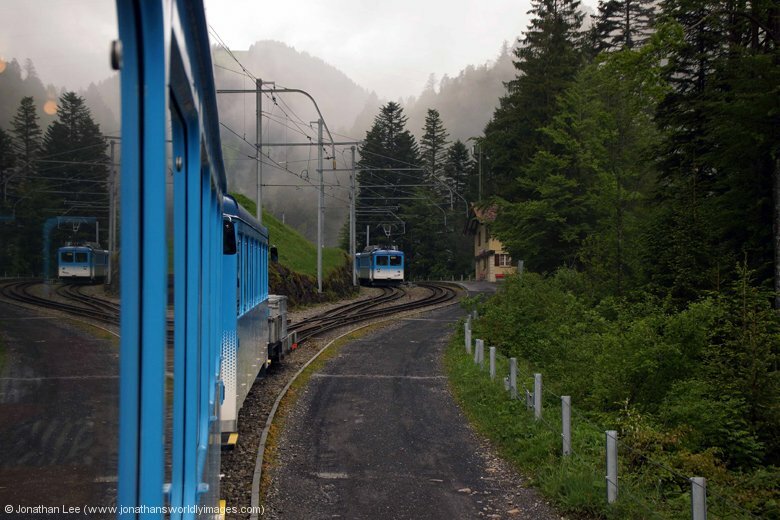 As we climbed the rack railway a works train followed us up to Staffel where the Arth Goldau line meets the Vitznau line. 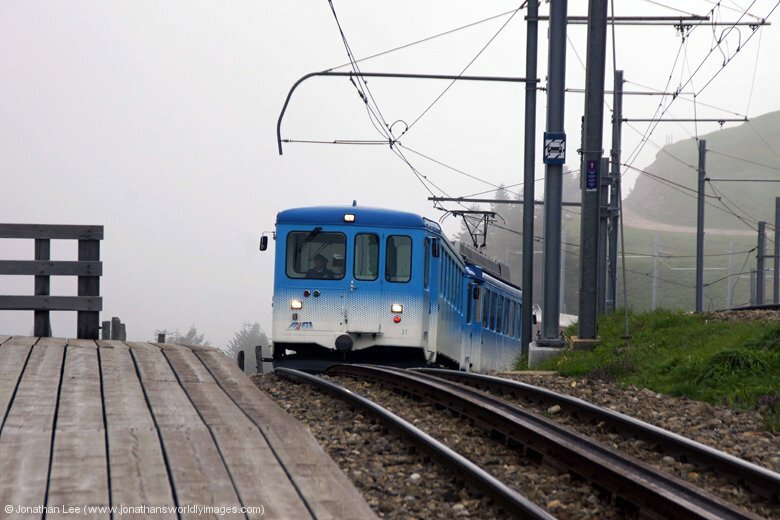 Both services from Vitznau & Arth Goldau are timed to depart Staffel at the same time to run through to Rigi and it soon became evident why as there are two lines that run almost parallel but one takes a higher line than the other! 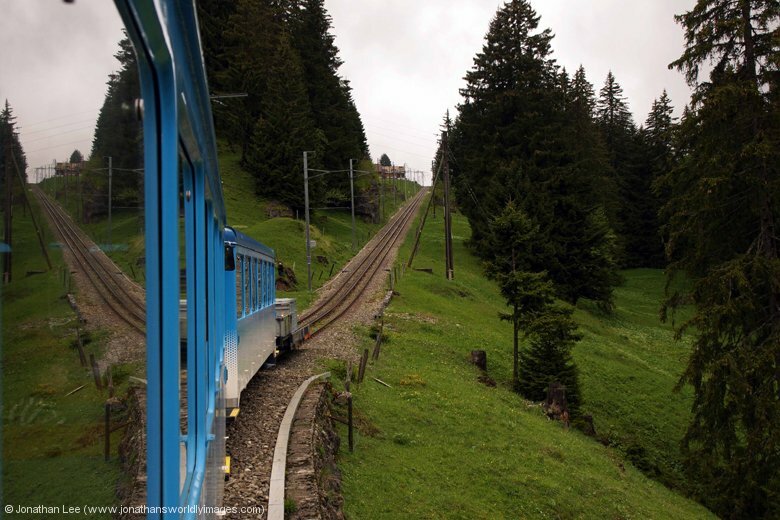 On this occasion though our blue BDhe4/4 #13 was allowed to run to Rigi Klum first while the red Bhe2/4 #1 from Vitznau followed closely behind with 1127 1215 Vitznau – Rigi Klum, on the same track. The cloud cover made it quite cool at the top of Rigi and just when we were about to set off on the short walk back down to the station the cloud broke and we got a fantastic view of Lake Luzern; it disappeared as quickly as it had appeared when the cloud moved across our line of view. For about 15 minutes the cloud broke every now and again and offered really atmospheric views of the lake down below, taking them away in a flash if you weren’t prepared with your camera. 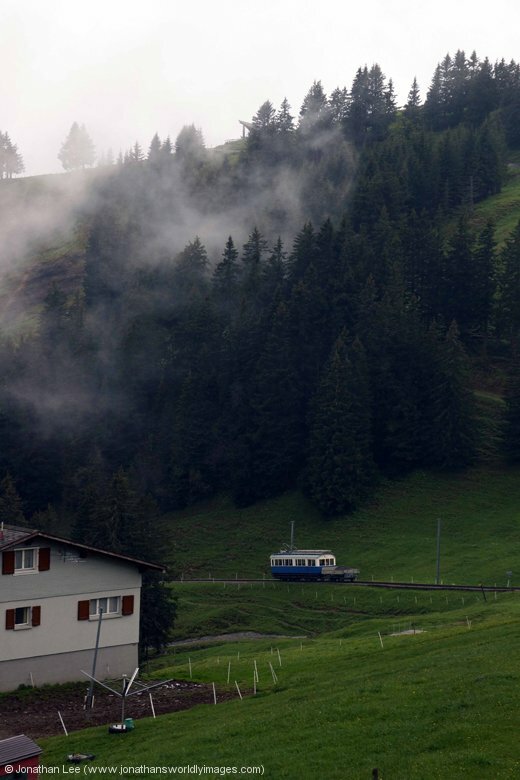 Despite the cloud we enjoyed every minute of our hour at Rigi and were very pleased we’d made the journey. To get back to Brig we headed down to Vitznau to catch the boat across Lake Luzern to Luzern itself and then head back by train. 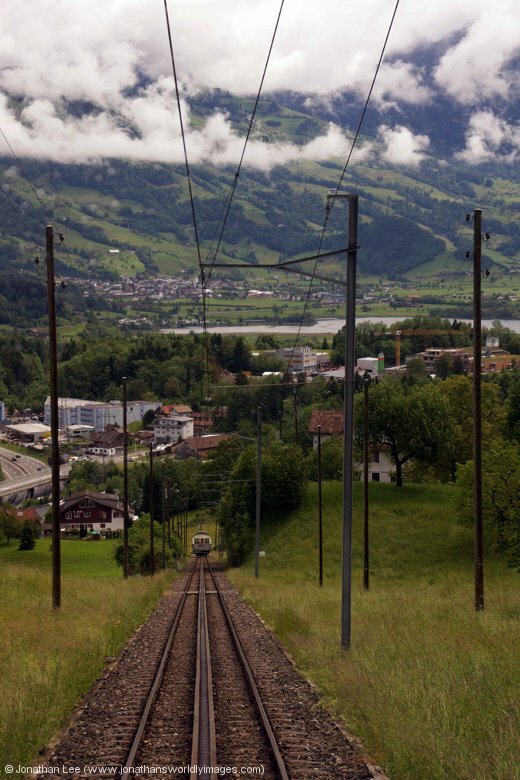 The inbound trains from Arth Goldau & Vitznau arrived into opposite platforms on this occasion and made use of both of the roads up the hill from Staffel. 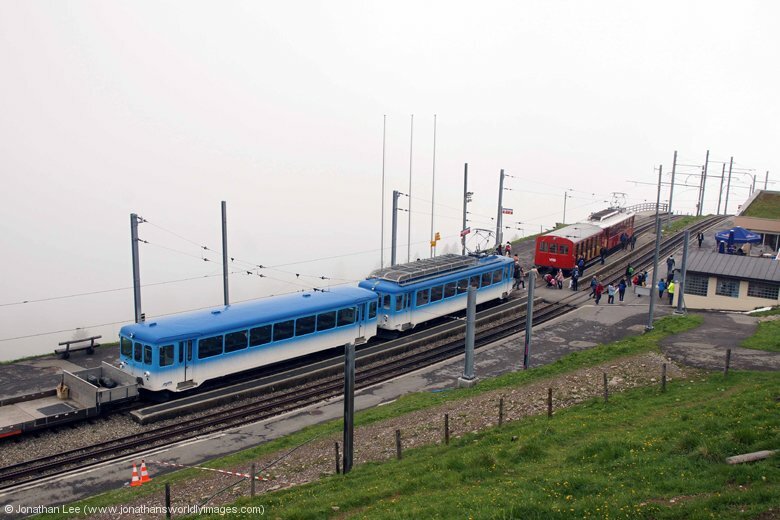 Blue BDhe4/4 #11 and red Bhe2/4 #4 formed 152 1404 Rigi Klum – Arth Goldau and 1134 1403 Rigi Klum – Vitznau respectively and both travelled down to Staffel simultaneously; where the works train that had followed us up from Arth Goldau earlier was sat waiting to follow #11 back down to Arth Goldau by the looks of where it was sat. As we headed down towards Vitznau views over Lake Luzern soon filled the horizon, once we’d got below the cloud. Then at Kaltbad First something totally unexpected happened when we came across RB He2/2 #18, of 1939 vintage, with a works train. As it shunted from the adjacent road to the same one in rear of us I commented under my breath that they might as well attach it to our train to save messing about and bugger me if they didn’t and the whole formation went merrily on its way down the hill with our driving car, a trailer vehicle and #18 plus its flat wagon. Upon arrival at Vitznau #18 was immediately detached and run into the adjacent platform; before we’d even boarded the boat, which had just arrived and we’d been watching make its way across the lake as we descended the mountain on the train. 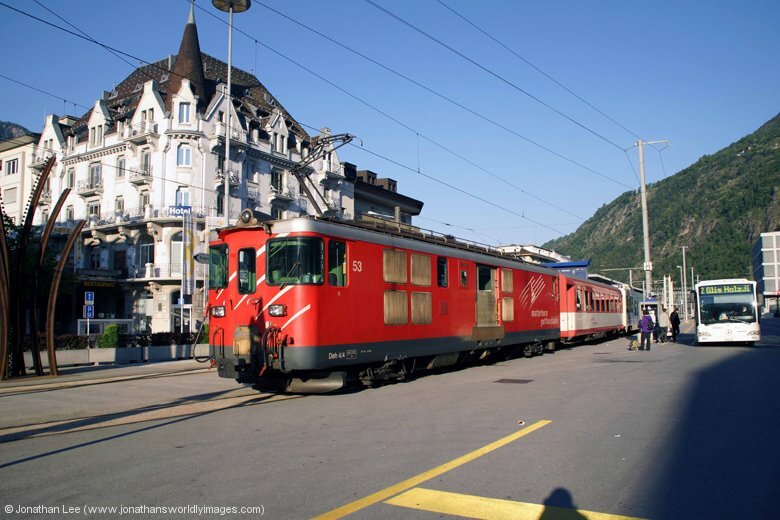 The boat that ferried us back to Luzern was called the Europa and was working the 1300 Fluelen – Luzern service. Tickets are purchased at the on board ticket office when you board and checked by one of the on-board staff when they do their rounds. Thankfully for us our Swiss Passes were valid on board so we didn’t have to pay anything extra to head back to Luzern via Vitznau. The journey took a little under an hour and was quite a relaxing one but was very efficient at its stops; which are clearly signed as the boats pull up and announced on board. 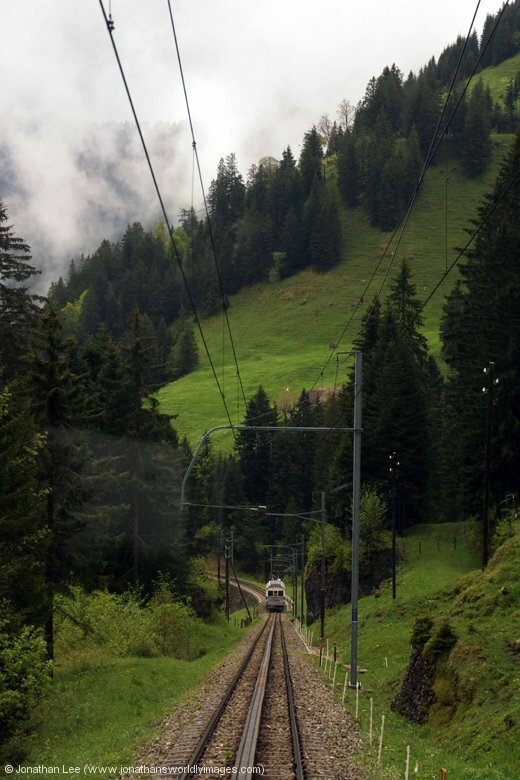 It was pretty much like being on a train and in true Swiss fashion very punctual. There are outside decks to sit on as well as an upper first class deck if you’re that way inclined and also on board restaurants should you feel peckish or thirsty. All in all I was quite pleased with the journey, even if it had started to rain by the time we got to Luzern. 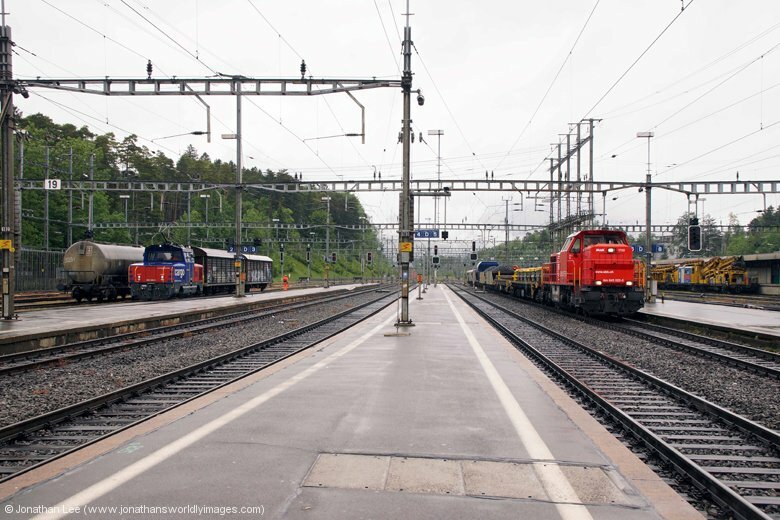 No time was wasted at Luzern and when BLS’s 465006 was spotted waiting to go with RE4378 1557 Luzern – Bern it was a no brainer when new 460085 was sat waiting to go with IR2528 1600 Luzern – Geneve Aeroport; which we did to Bern for 460116 to Thun on IC977 1559 Basel – Interlaken Ost and then 460057 to Visp on IC824 1441 Romanshorn – Brig before enjoying an MGB trip aboard 558 1808 Visp – Andermatt with MGB Deh4/4 I #52. 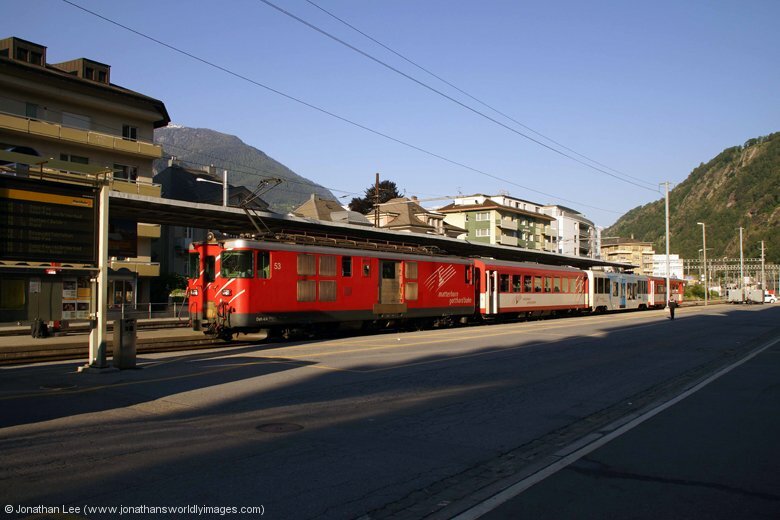 While at Visp MGB HGe4/4 II #1 was sat waiting to depart with 257 1808 Visp – Zermatt, which was noted for later, and at Brig Bahnhofplatz MGB Deh4/4 II #91 was sat waiting to go with 359 1827 Brig – Zermatt. These were the first two trains I’d seen that had been loco-hauled on the Zermatt line since the new EMU’s had arrived and the timetable had changed; which sort of rendered the most recently issued MGB diagrams as useless now trains didn’t follow the usual pattern and didn’t run direct to Göschenen and most of the Visp to Zermatt services ran through to Fiesch. Still, having consulted the MGB timetable, I was hoping #1 would return on the 1937 from Zermatt to Brig if I ventured out later. The staff at the Channa restaurant that evening had all changed but the food and service was as good as it had been on any other evening and having spent the time and money we had done there it should have been. 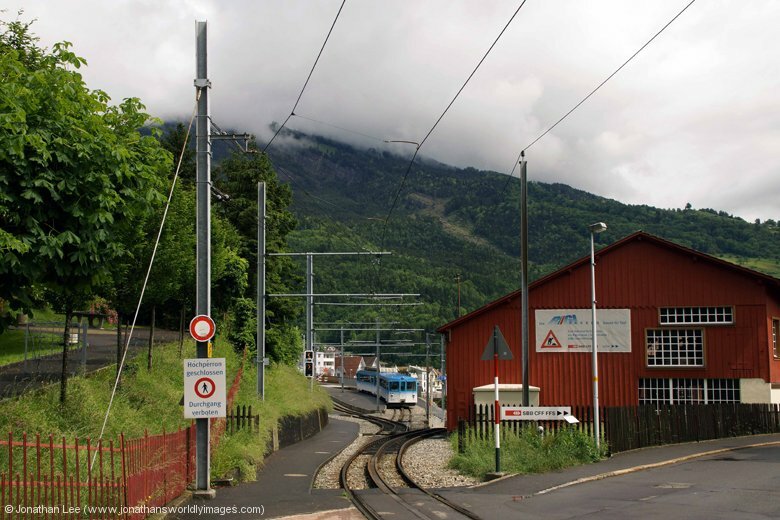 After dinner I went to the station with a view to doing the 2038 MGB train to Eyholz request shack to meet #1 coming back from Zermatt with 270 1937 Zermatt – Brig; thankfully the fact that new 460047 was sat in the main station with IR1842 2028 Brig – Lausanne saved the day. MGB’s #1 did return from Zermatt with train 270 but when it passed the 2038 ex Brig it was an EMU; correct move played thanks to a new Re460! That was basically the end of the trip and all that was left to do was pack, sleep, get a train to Geneve and depart on the plane! We had to be on the 0728 train from Brig to Geneva Airport so we snook into breakfast at 0645, even though it didn’t start until 0700, and were the only ones in there early! Checking out of the Good Night Inn was a simple case of handing the room cards back and saying goodbye, having paid on arrival, and we had a nice bay of four all to ourselves for the whole journey from Brig to Geneva Airport, on the lake side (left in direction of travel towards Geneva), despite quite a bit of foot traffic using the train in the Lausanne/Montreux area. 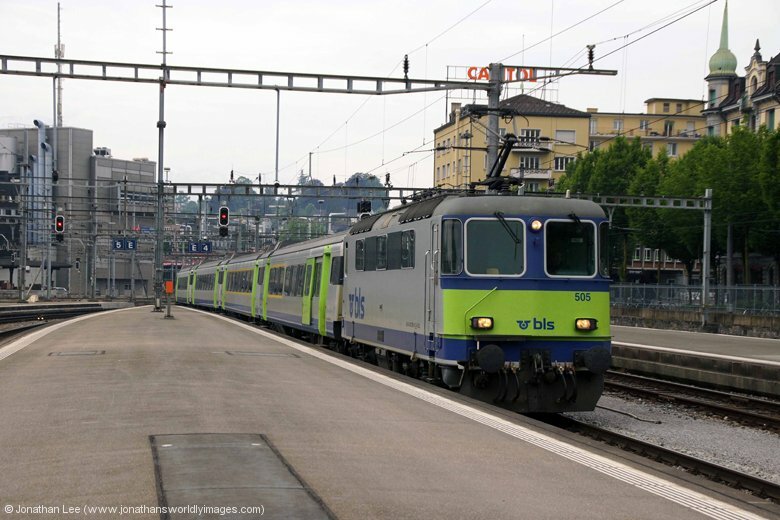 460002 delivered us to the airport station bang on time with IR1816 0728 Brig – Geneve Aeroport and with the short walk to the airport we were through security and sitting down relaxing 15 minutes later; checking in online via BA’s mobile app helped. Our plan was on time, not full and we had cracking views of the mountains leaving Geneva and also of London as we neared Heathrow; for the first time ever I managed to get some photographs as we flew over London! The London Underground was running well and we had plenty of time to make our booked 1633 Kings Cross – Leeds back to Doncaster and even managed to pass some time in Starbucks at St Pancras. Having had a load of East Coast reward points to use up before Virgin abolished the scheme I’d booked us a couple of free first class seats back to Doncaster and just as my wife was asking where we were sitting I told her I was jumping into coach H, which she didn’t quite believe until I continued to walk into the inside of the coach; and a very nice afternoon journey back it was too with friendly staff and not too many on board in first class. It was just what we needed at the end of a lengthy journey that had basically been Brig to Doncaster with only a bit of time festering at the airport for our plane. It was always good to be back home though but not to the grind the following day! I was there the following week and it was in the high 80s every day .